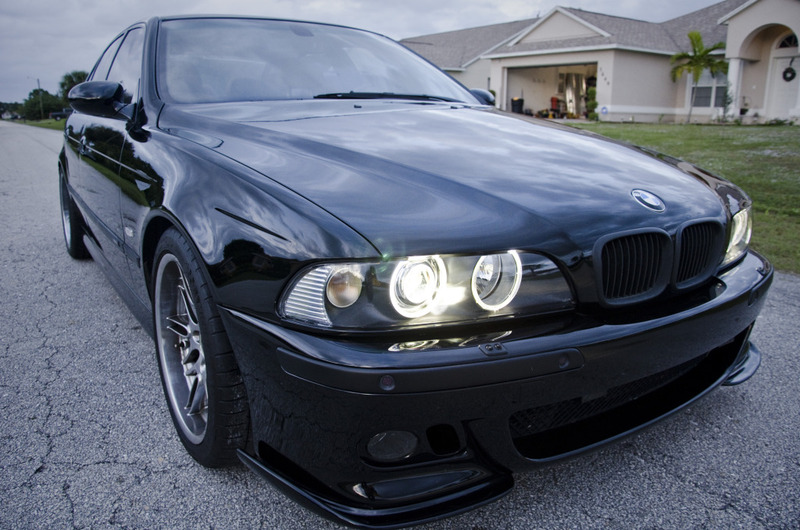 More from Florida Detail Fest, another E39 M5. 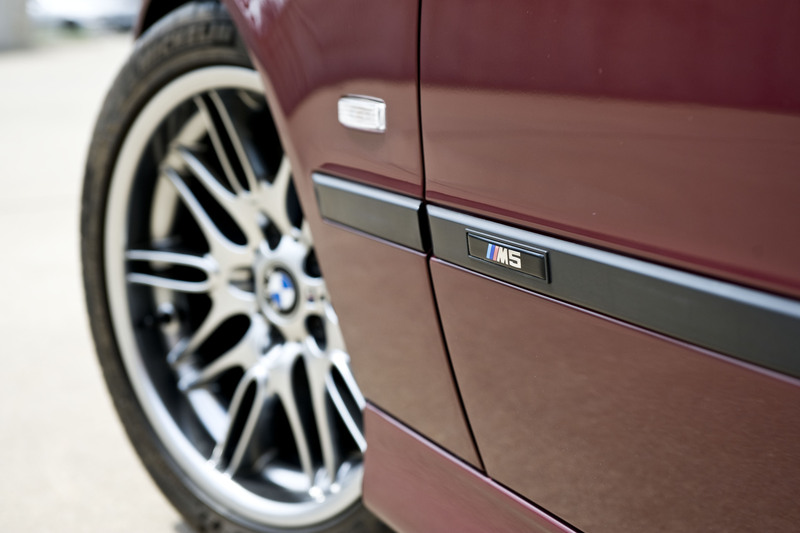 This Titanium Silver M5 was in for a pin stripe removal, dual stage paint correction, Opti Coat Pro topped with Gloss Coat, Glass Coat Pro, Wheel and Caliper Coating, and Interior Clean and Condition. Needless to say there was a lot of work and I hardly got any pictures of the process. Lets start with some interior leather cleaning. 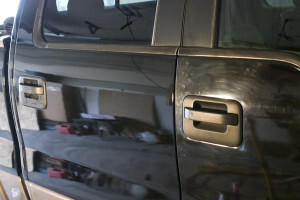 Initially it looked like the leather had abraded on the door handle. 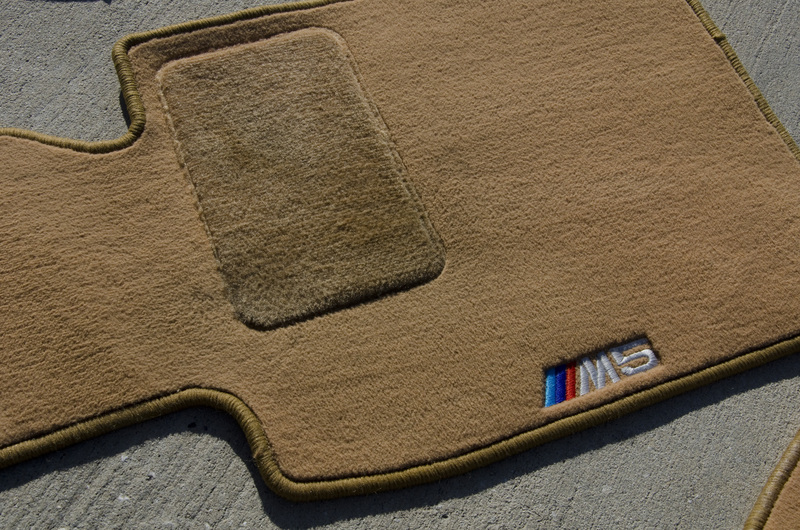 But after gently cleaning away years of use, the leather appeared as good as new! 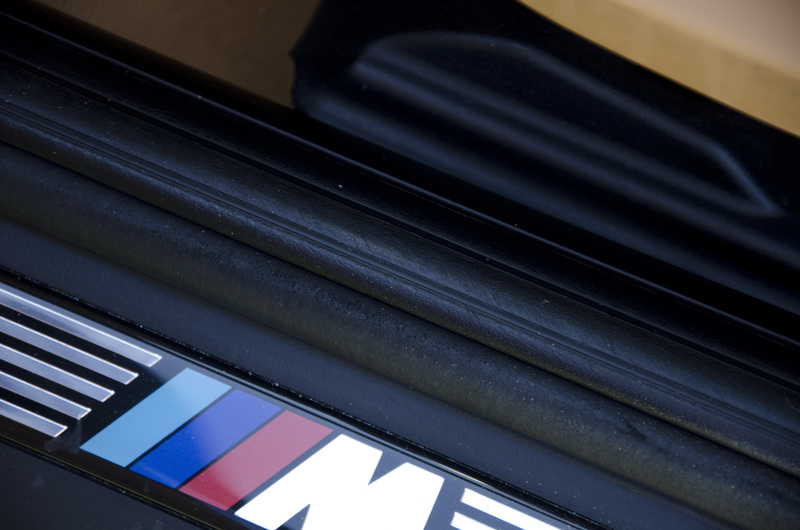 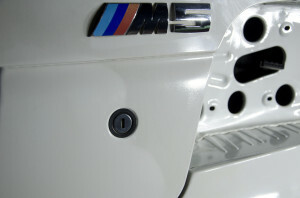 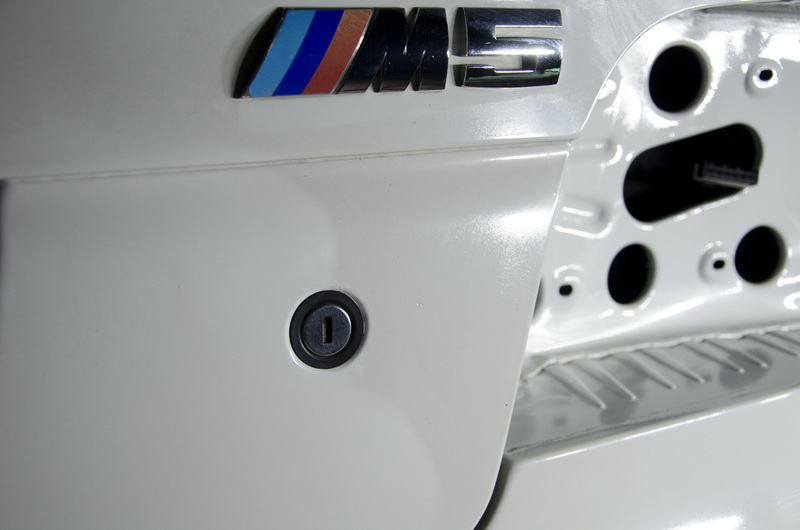 Here is what most of the time was spent on: A dealer installed pinstripe in the M colors. 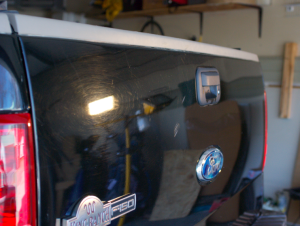 The stripes had faded and the owner had no interest in keeping them around, let alone locking them in under the ceramic coating to be applied (Opti Coat Pro). 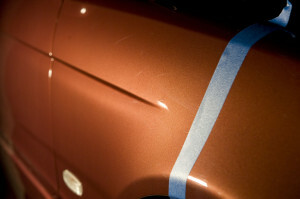 The stripes were gently sanded away with a 2000 grit wet sandpaper. 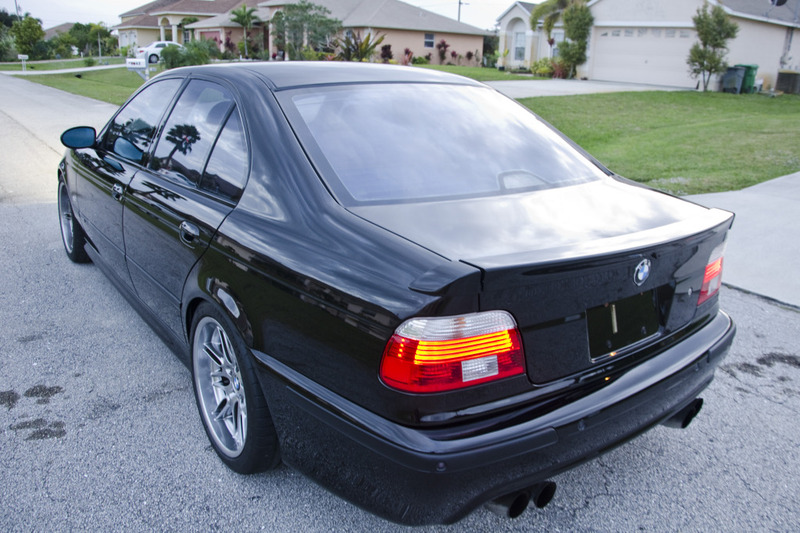 eM Detailing was in Florida to work on M5board member GSFent’s car. 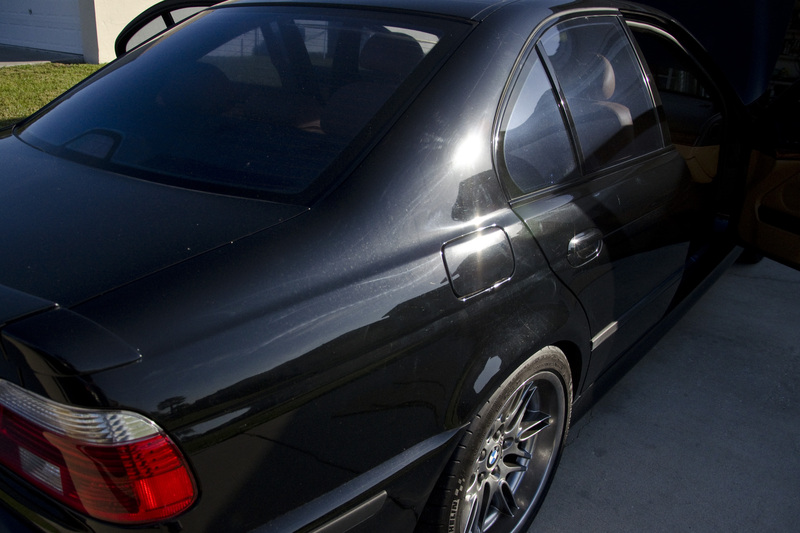 This 570hp supercharged M5 came in Jet Black, a very soft and difficult color to work with. Over the course of the car’s life the soft black paint had acquired many swirls and light scratches. 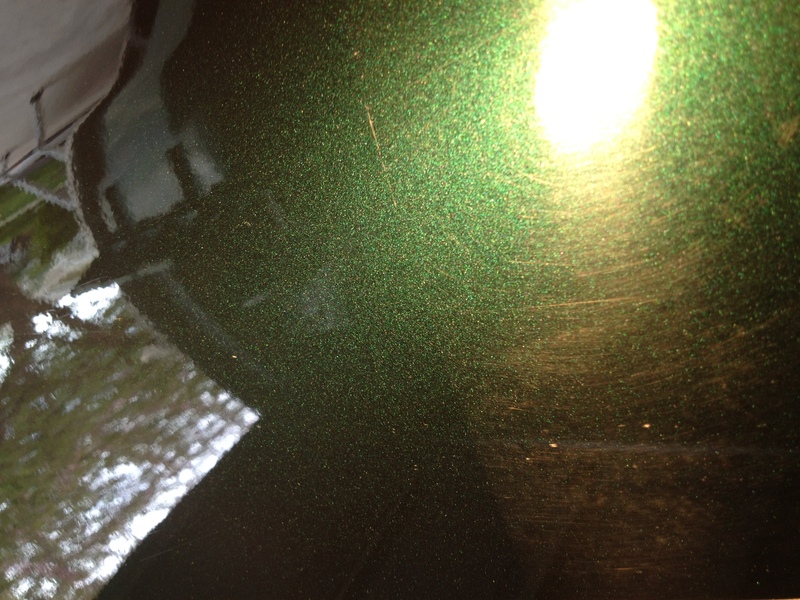 At some point a “detailer” with a rotary polisher left some unsightly holograms in the paint as well. 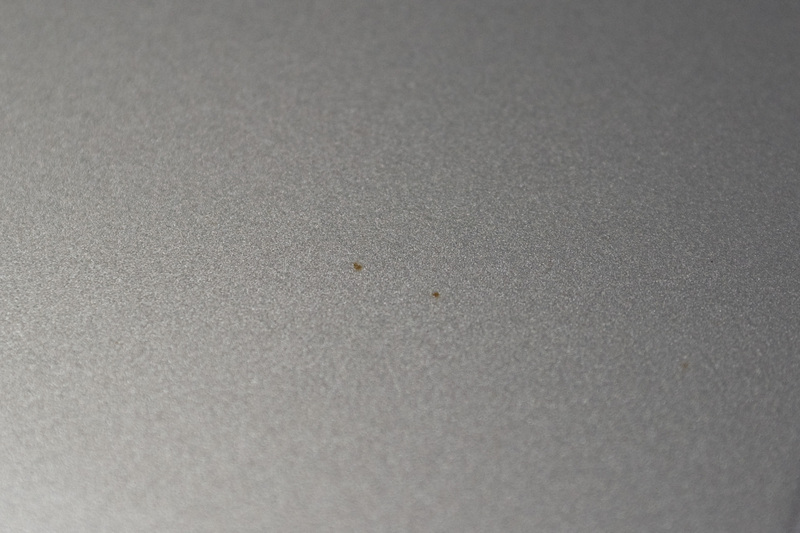 There was also a film buildup of hard water and a little bit of etching from bugs (click any picture to enlarge). 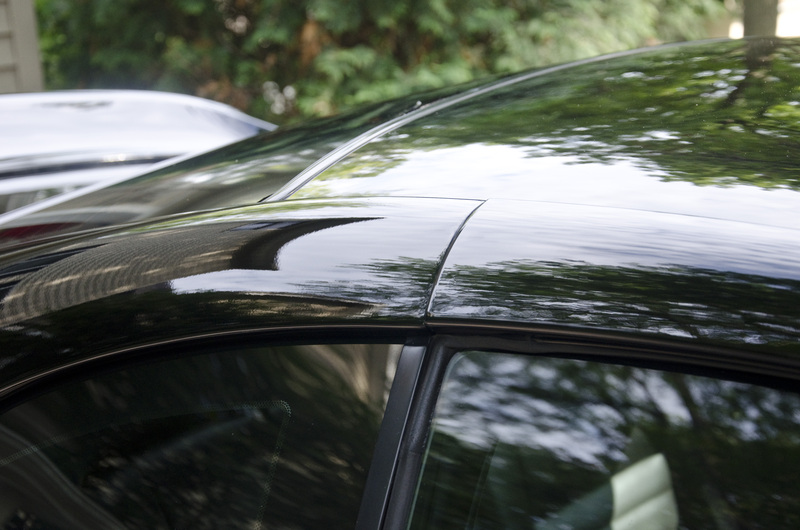 As usual, we started with decontaminating the exterior with a thorough wash and iron removal step, as well as clay bar where needed. Before starting on the paint correction, the interior got a thorough wipe down and vacuum and we focused on cleaning the leather and stitching on the M-Sport steering wheel. All leather was then conditioned and various stains were removed from the carpet. 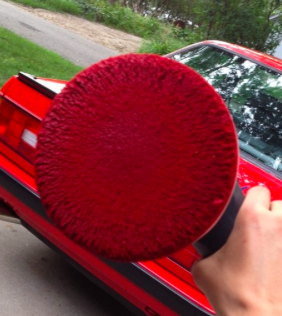 Some overspray from a leather dye job. 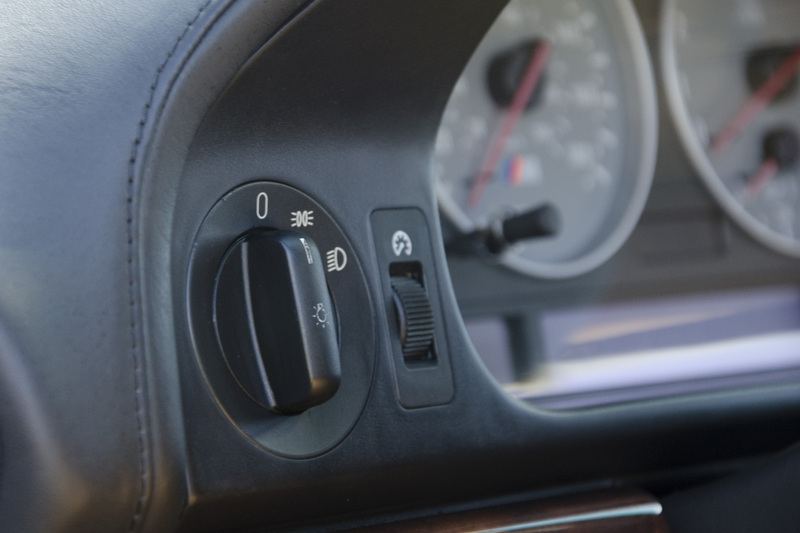 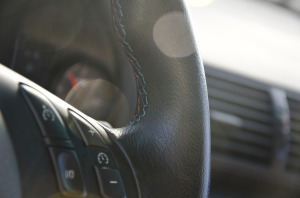 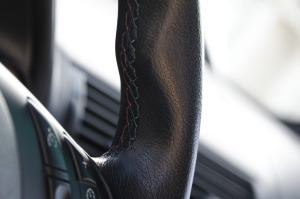 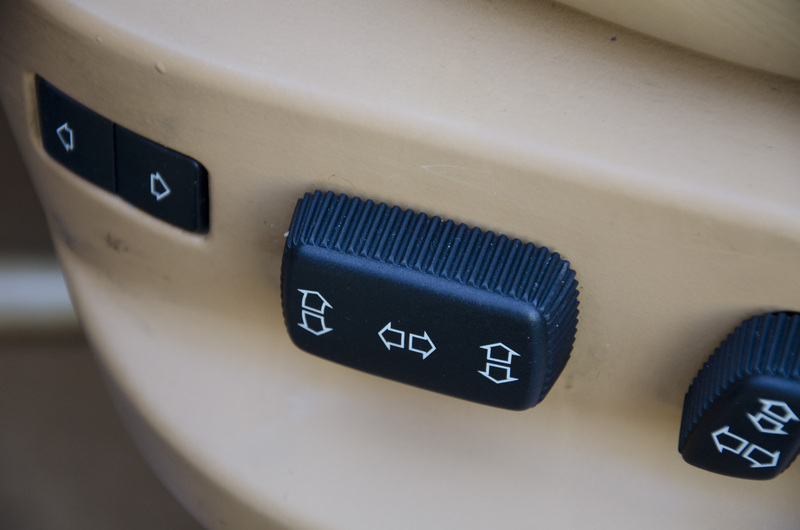 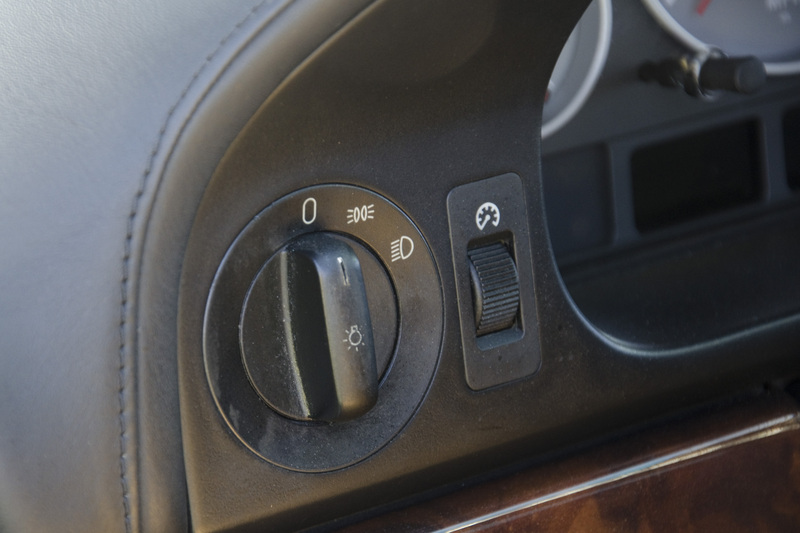 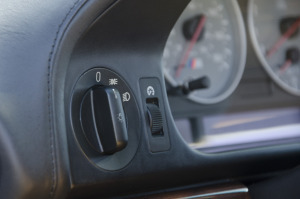 Did you know there can be as many as 700 different germs per square inch of steering wheel? That is 9 times more than a public toilet! 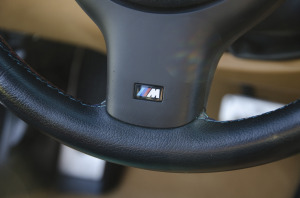 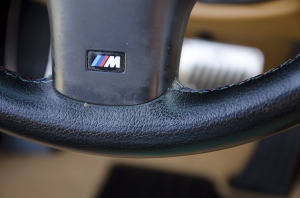 As we cleaned the steering wheel and the M-Sport Stitching the wheel was restored to its original matte lustre. 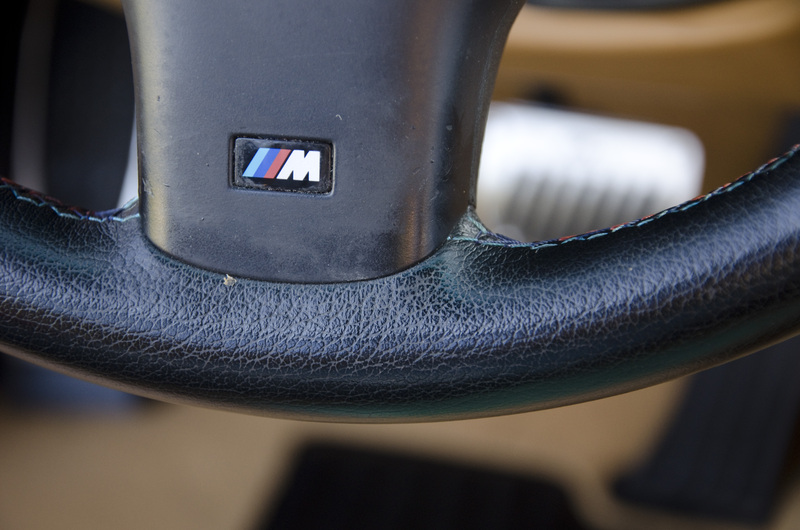 Few coffee spots here and there, no match! Unfortunately there was a lot to be done, and not a lot of pictures were taken. 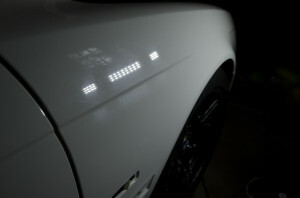 Here are just a few shots showing the difference. 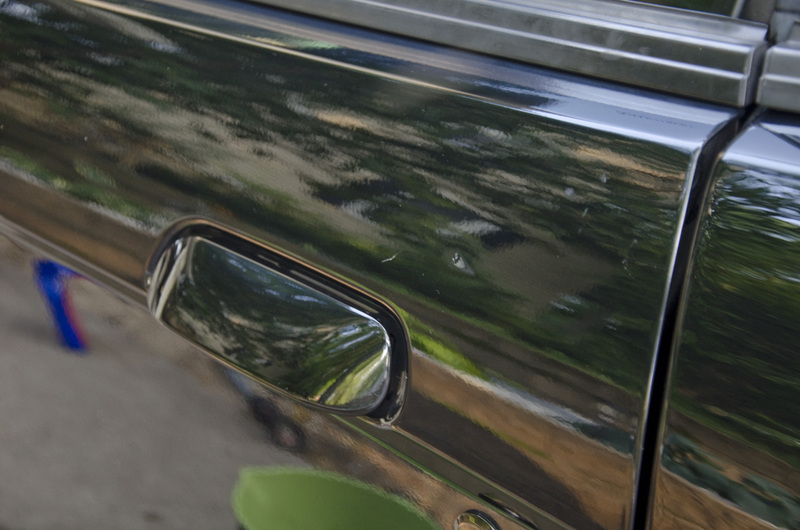 Contrast between door (unpolished) and quarter panel. After paint correction the entire car was coated in Opti-Coat Pro, which was then topped in Gloss Coat for even more shine and slickness. 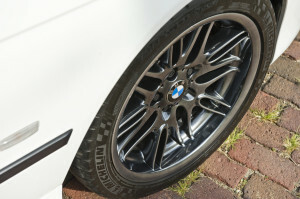 The wheels were cleaned and Opti-Coated as well. 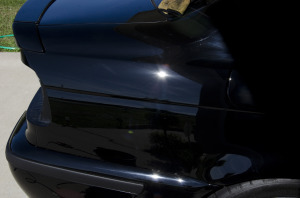 Opti Coat Pro is a ceramic coating applied after paint correction that provides wax like properties of water beading and UV protection, permanently. 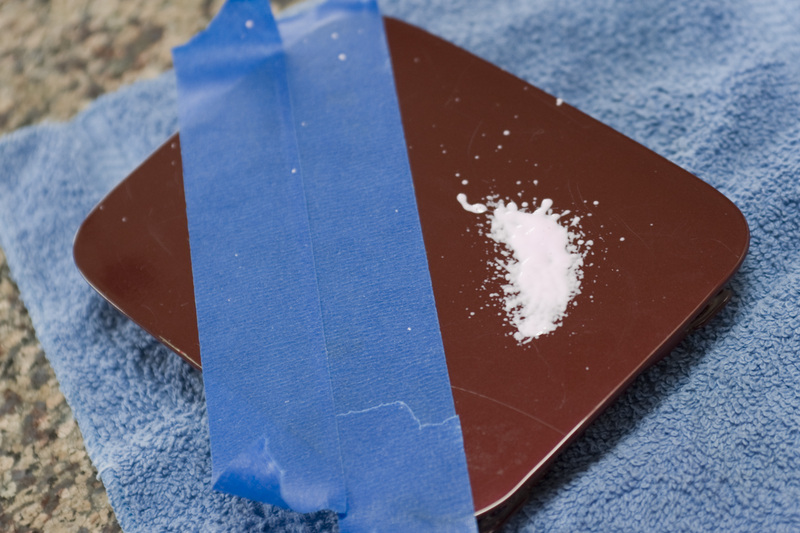 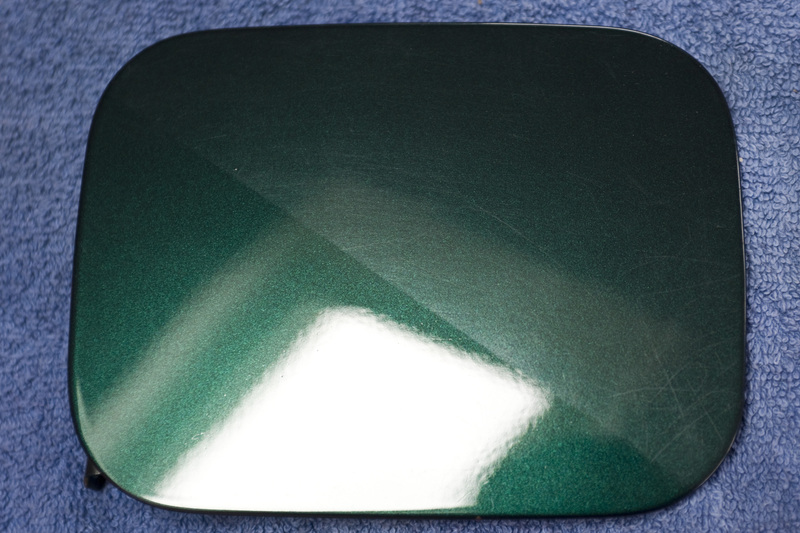 Opti Coat Pro does not strip off and cannot be removed other than through heavy compounding. 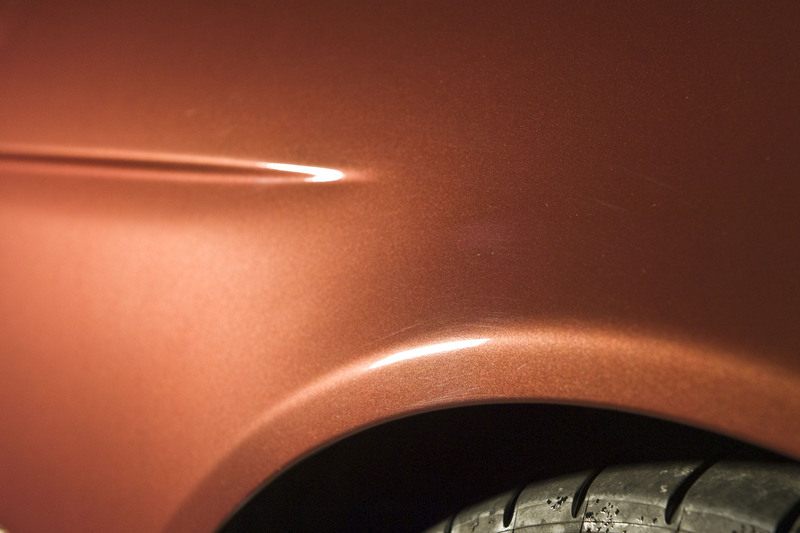 We topped the Opti Coat Pro with Gloss Coat, which provides even more shine and slickness for up to two years. 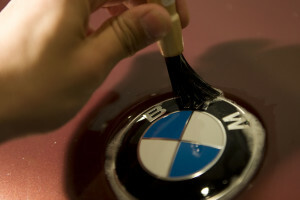 No need to wax again, ever! 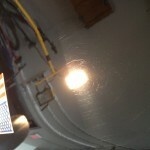 Below is a video of this car repelling water with Opti Coat Pro alone, once we added gloss coat, repellency went up, like this silver M5’s video(scroll down). 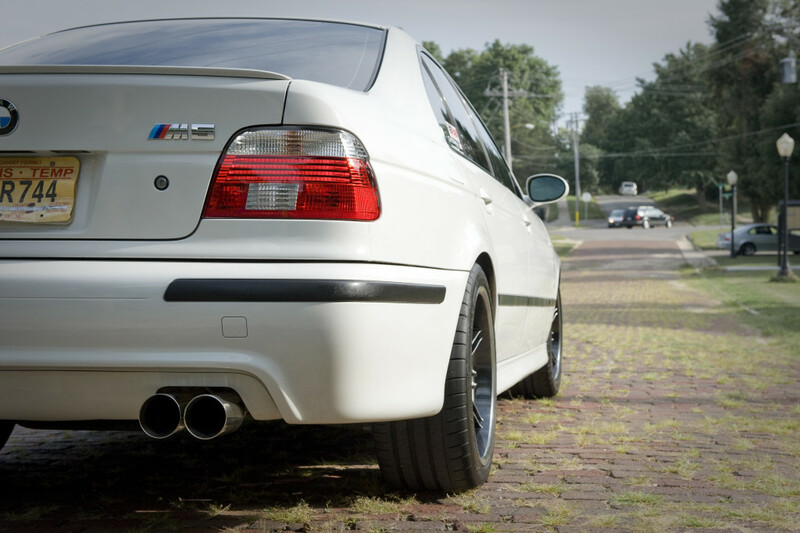 Like the Chiaretto Red, This 2003 Alpine White M5 came to us all the way from Chicago for a paint correction and ceramic coating. The owner was already familiar with the benefits of Opti-Coat from his other car, and wanted his new M5 to have the same quality protection. 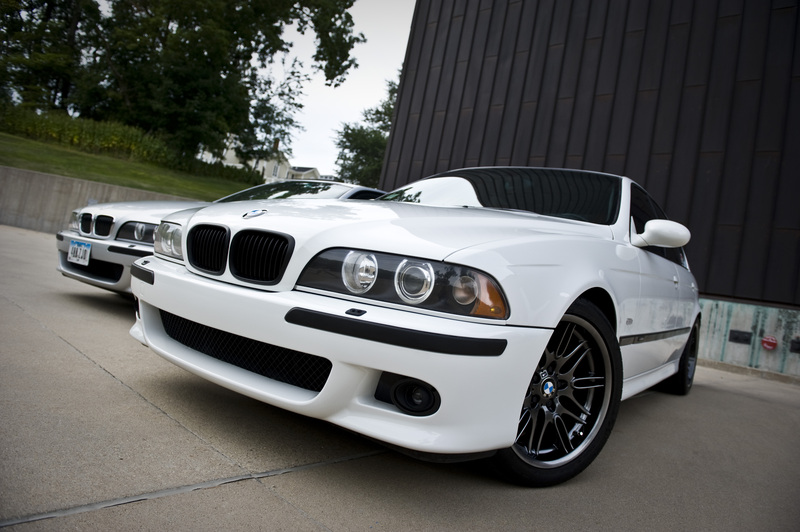 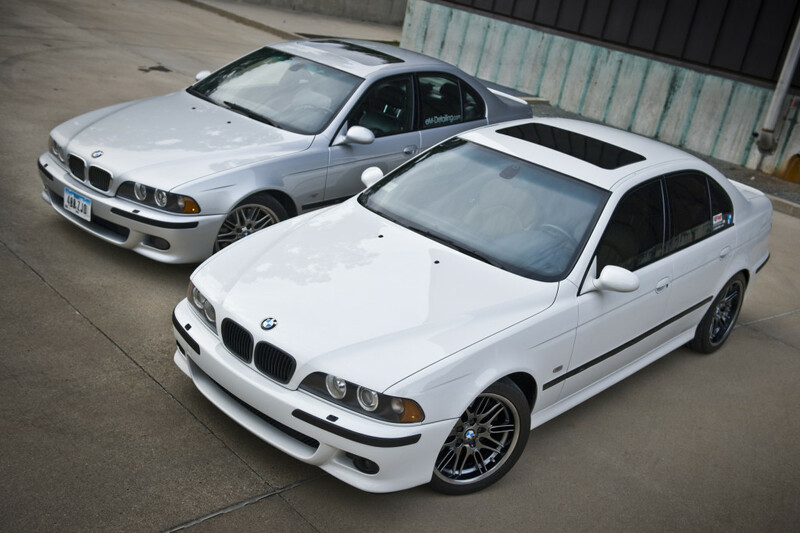 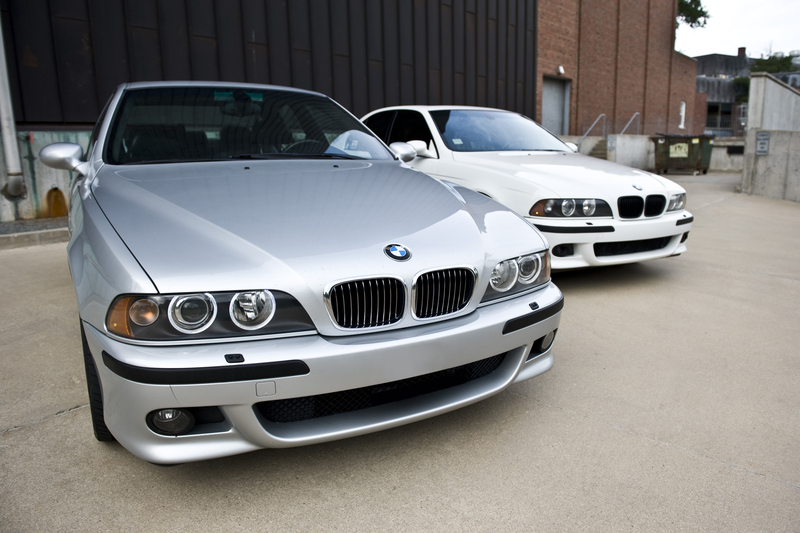 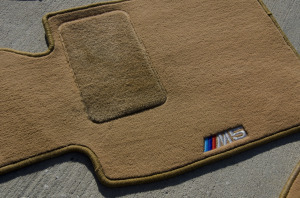 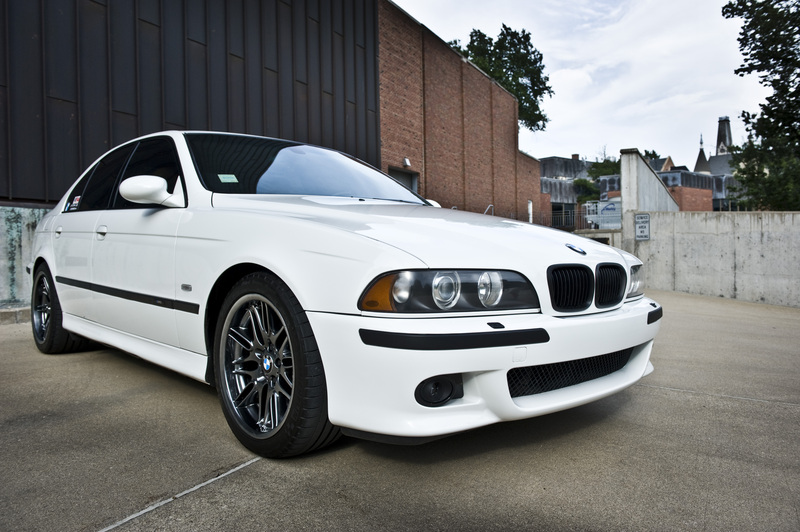 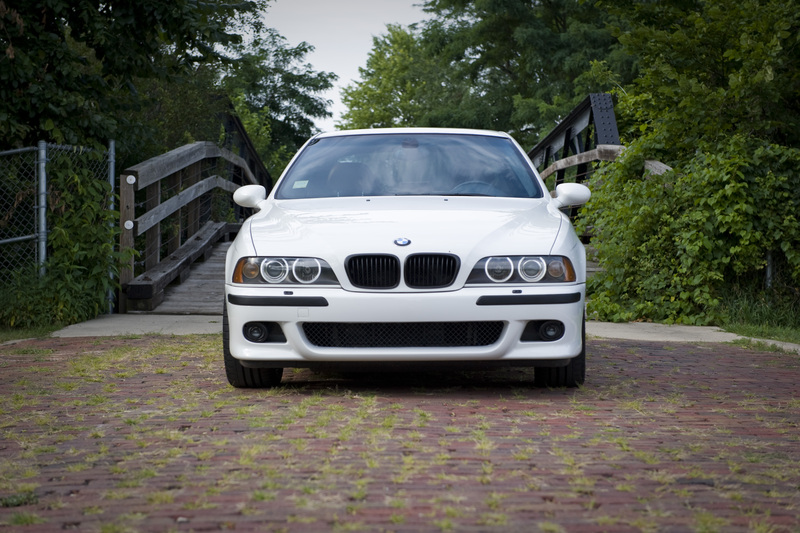 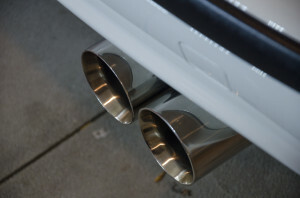 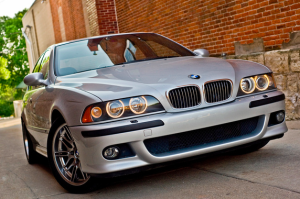 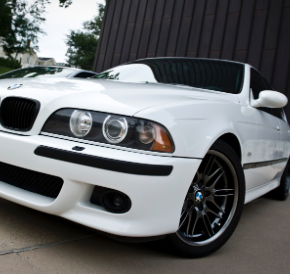 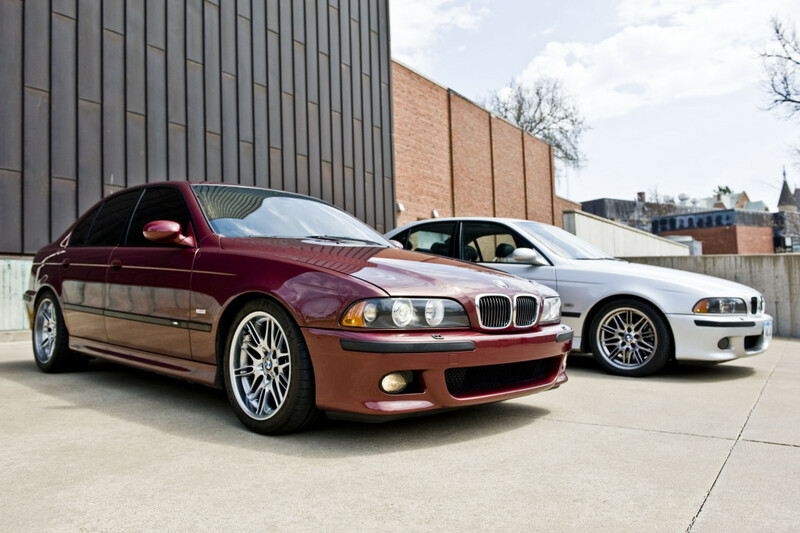 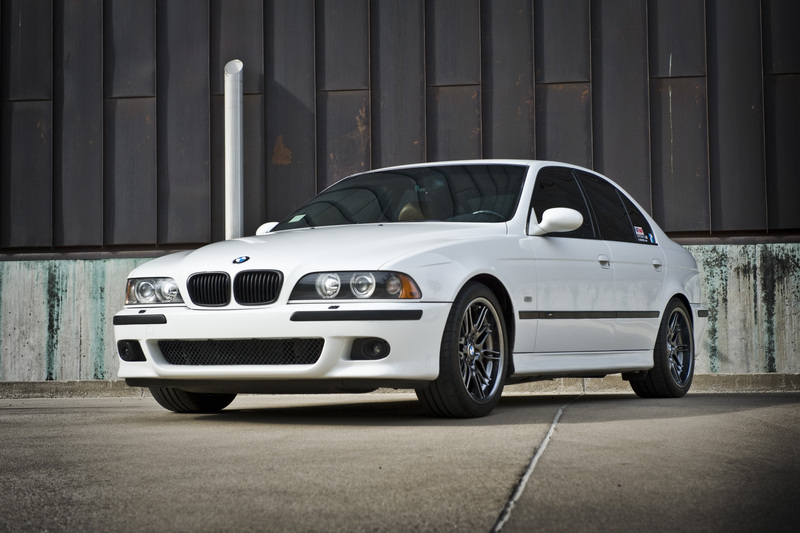 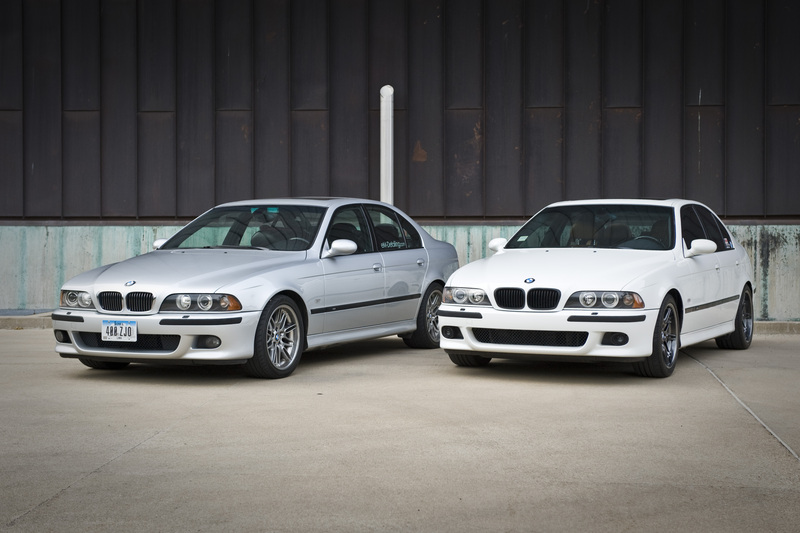 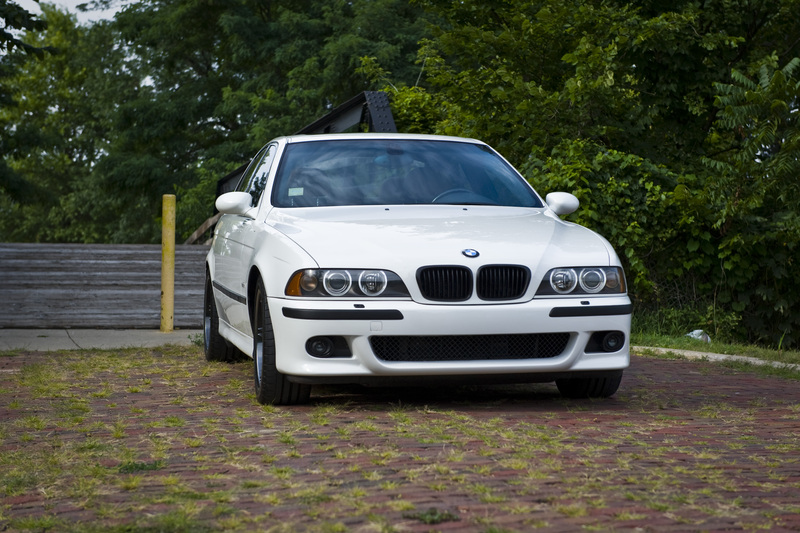 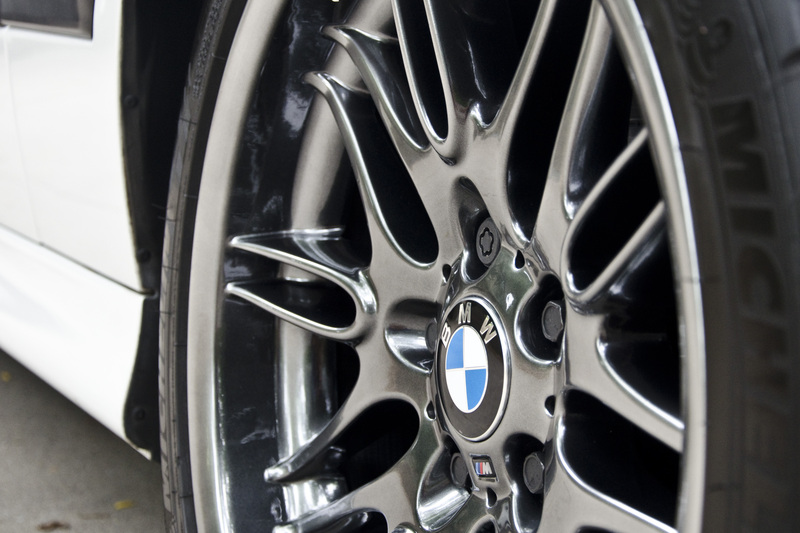 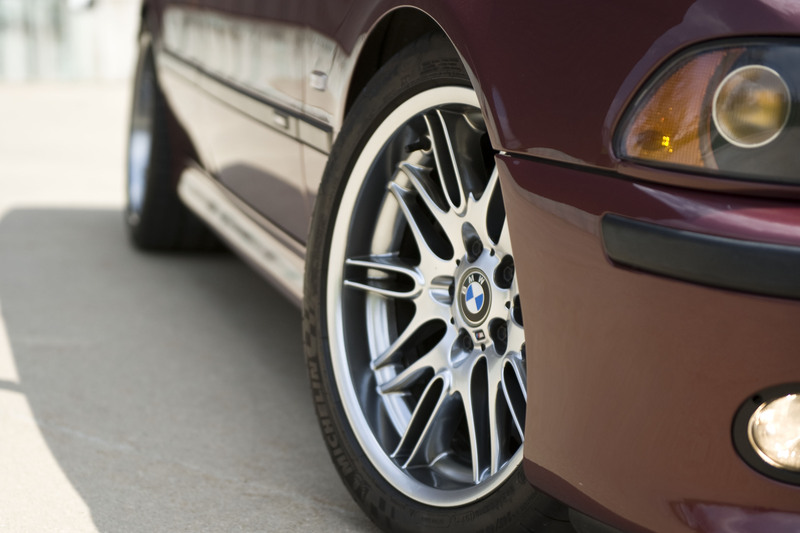 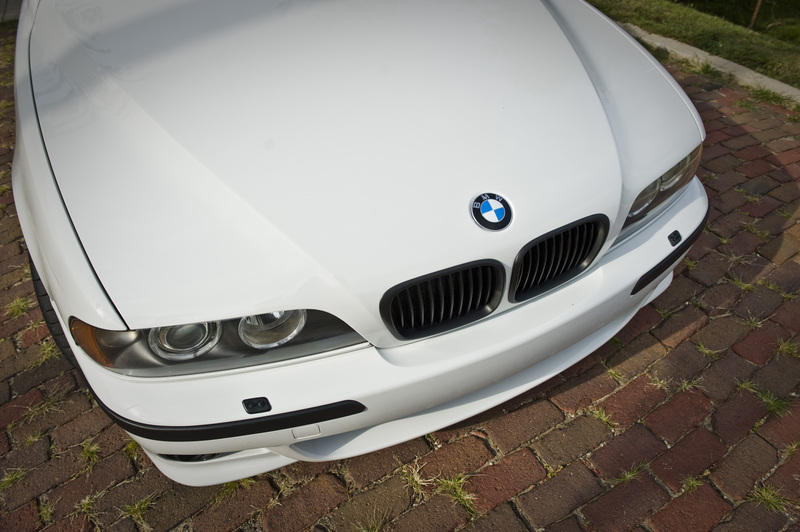 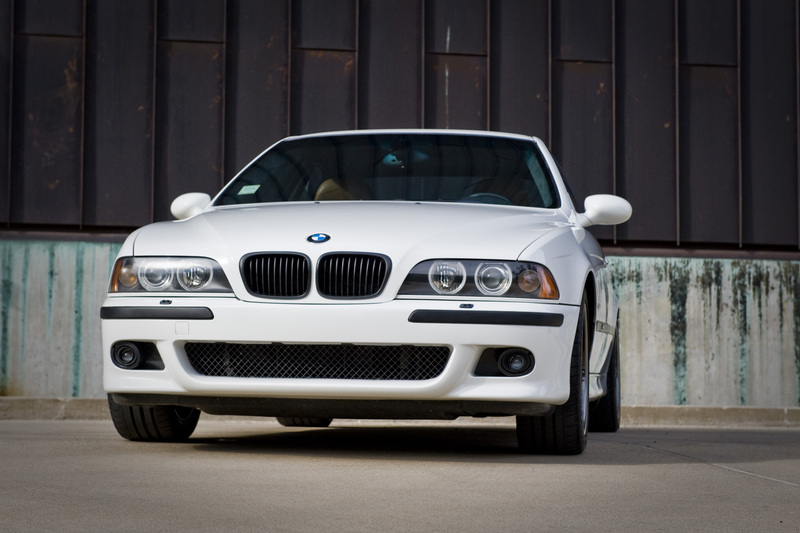 We know BMW’s, especially E39’s, and all their dirt accumulation areas. 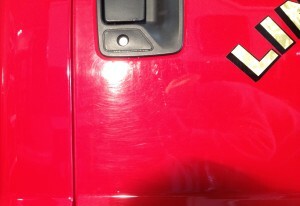 Trim and lights were removed and soon the car looked like it had entered a chop shop. 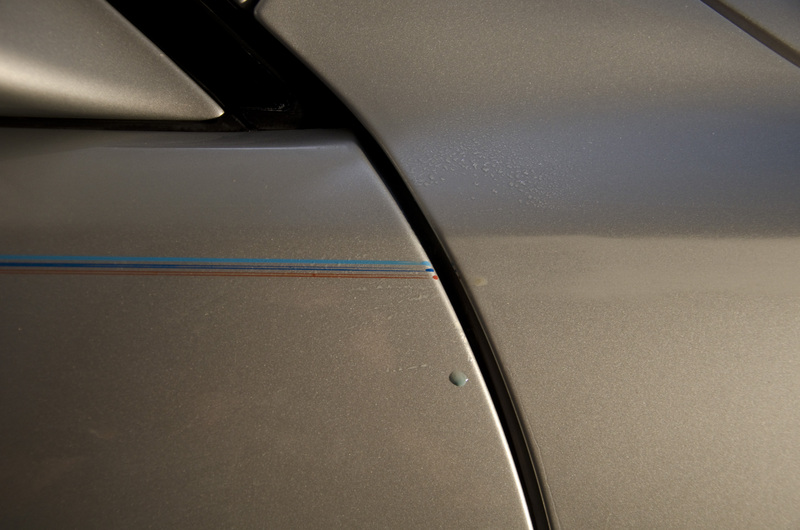 Another concern the owner had was the poor touch up job done on the front of the car; although it looked like someone had used whiteout to touch up paint chips, in reality we suspect this is due to the huge paint brush that comes with BMW touch up paint. 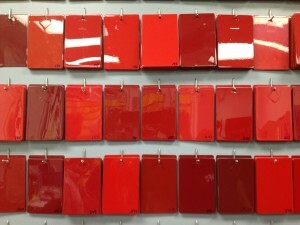 Ironically, all the excess paint remained, except on the actual paint chips. We wet sanded away the excess paint, and reapplied (with a fine point brush) new touchup paint where appropriate. Sanding marks were later polished away with compound (making sanding marks disappear is still one of life’s miracles). 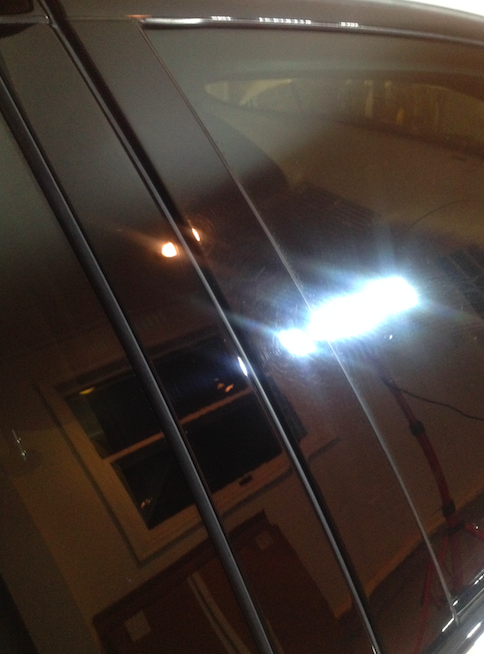 And on to the polishing, click to enlarge. 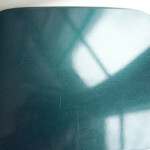 The trunk lid had been repainted, badly. 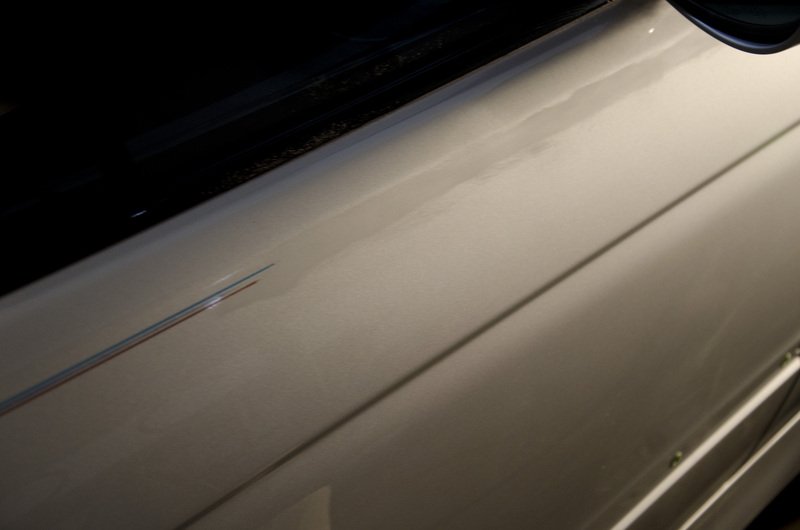 The difference in paint texture had trapped pollutants and slowly changed the color of the trunk lid to an off-white/beige. This was mostly noticeable after we polished away the contaminate. 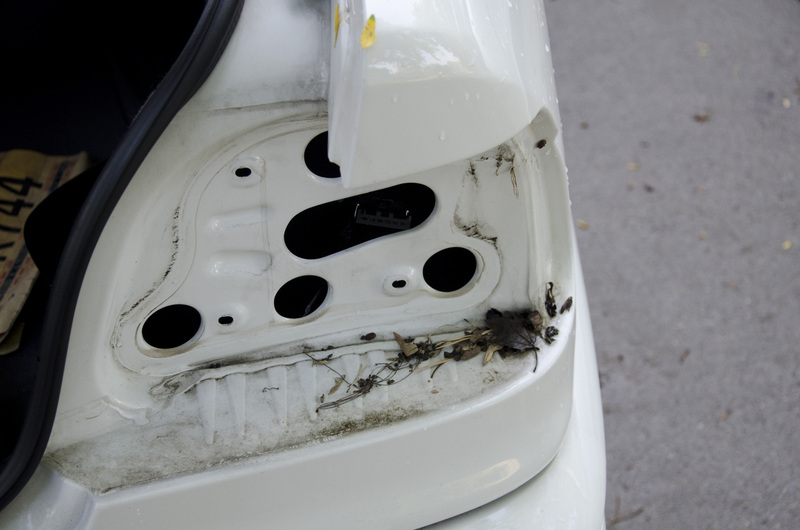 The trunk, matched much more closely with the rest of the car now. There was a significant amount of overspray on the front fender as well. 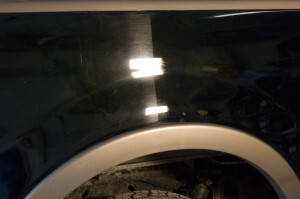 We got rid of all of it, though forgot to take a picture so you will have to take our word for it..
All trim pieces were cleaned and treated with 303 Aerospace protectant. 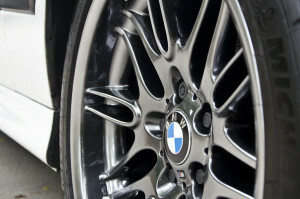 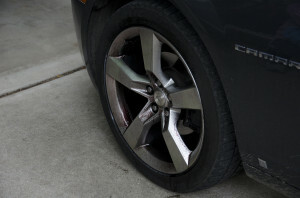 The style 65 wheels were removed, cleaned, and coated with Opti-Coat. 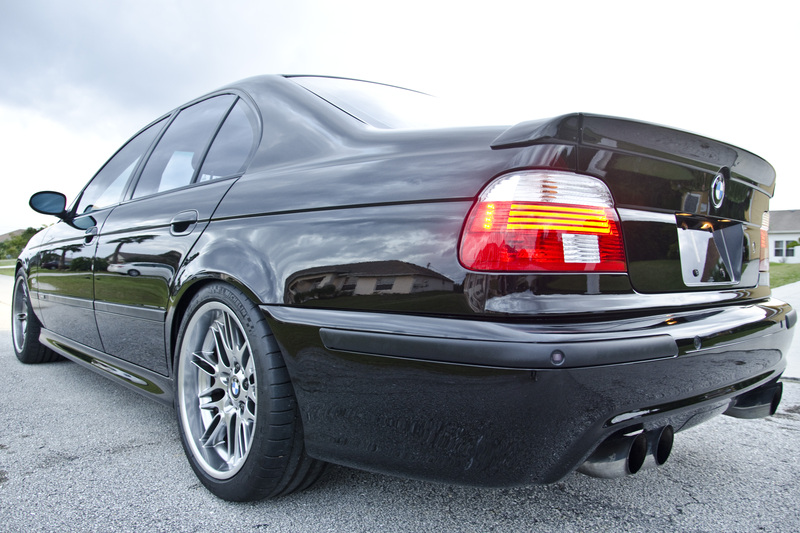 The owner accused us of performing magic on the wheels as he did not recognize them anymore 🙂 Tires were dressed in 303 aerospace protectant, and exhaust tips were polished up as well, revealing the dual wall construction. 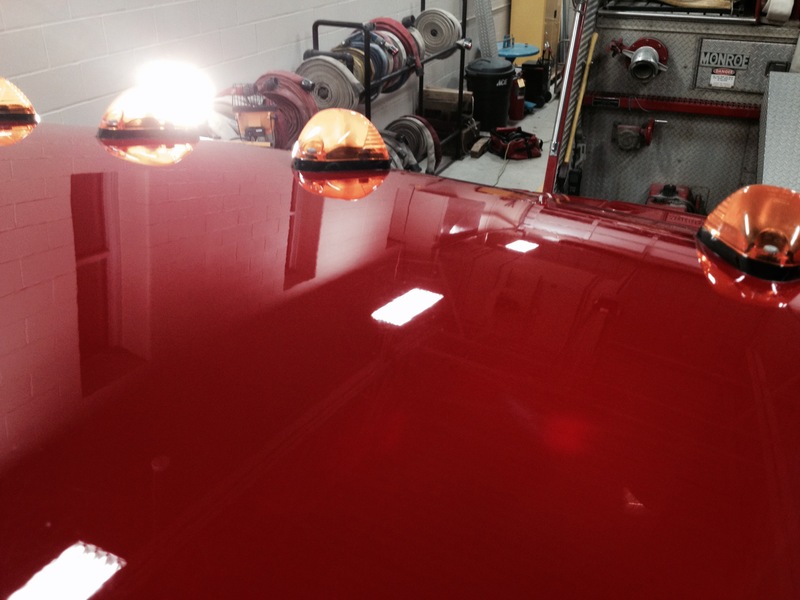 Following a final inspection, the car was prepped, and coated with Optimum Opti-Coat 2.0. 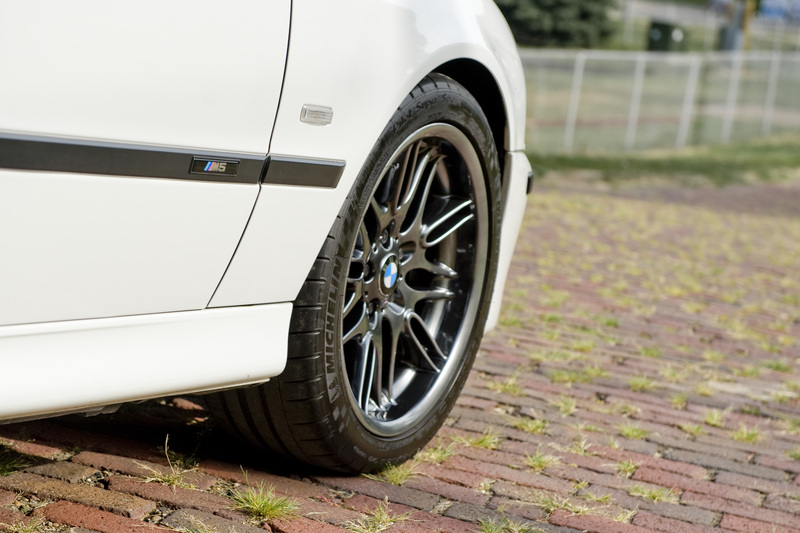 We finished the day with a photoshoot, my own Titanium Silver M5 made a cameo as well, sporting its fresh coat of Gtechniq EXO. 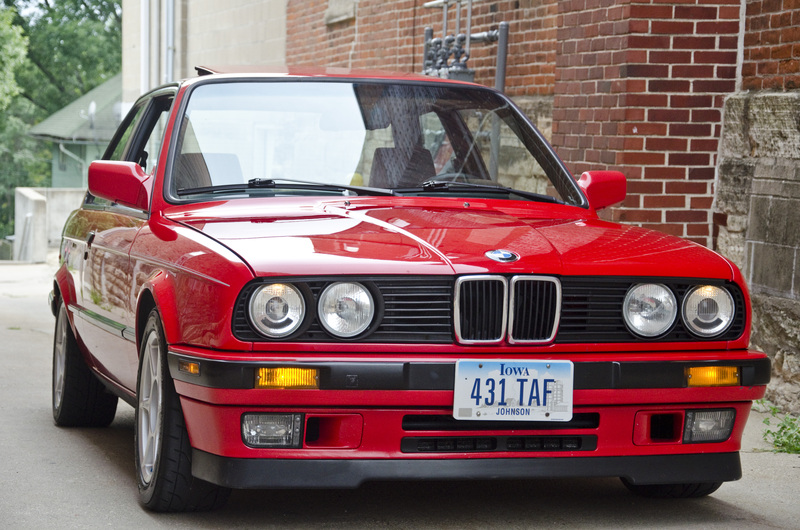 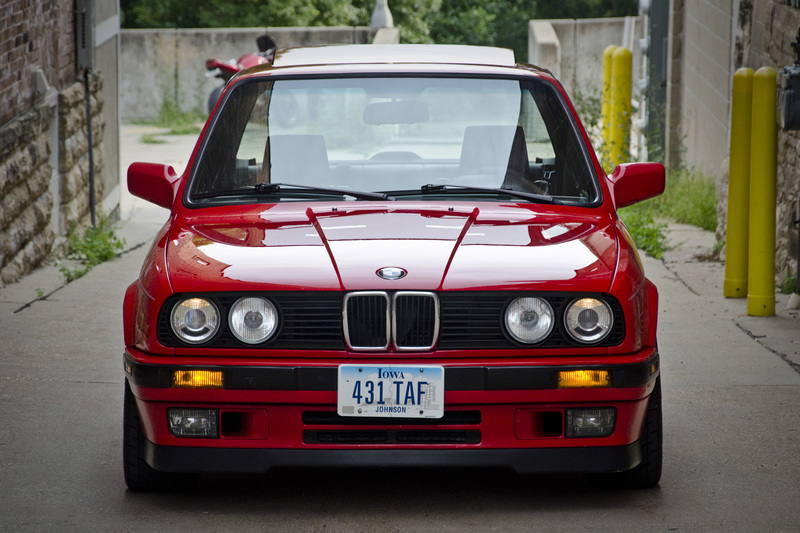 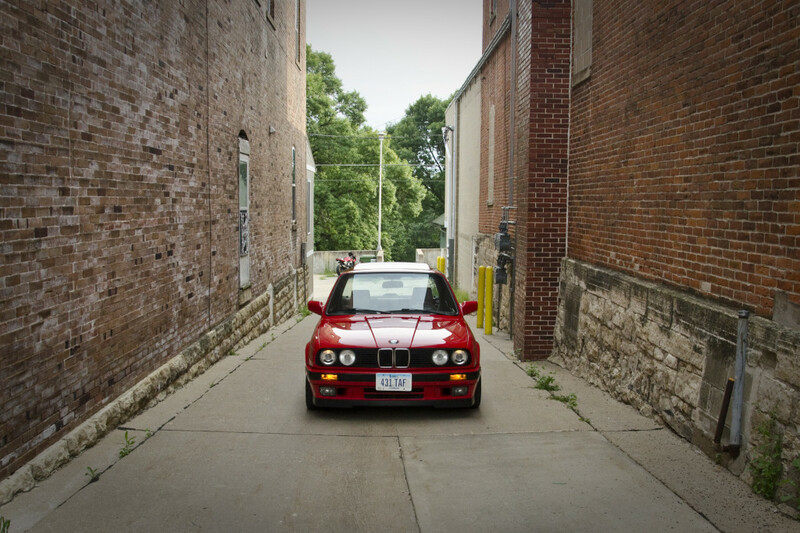 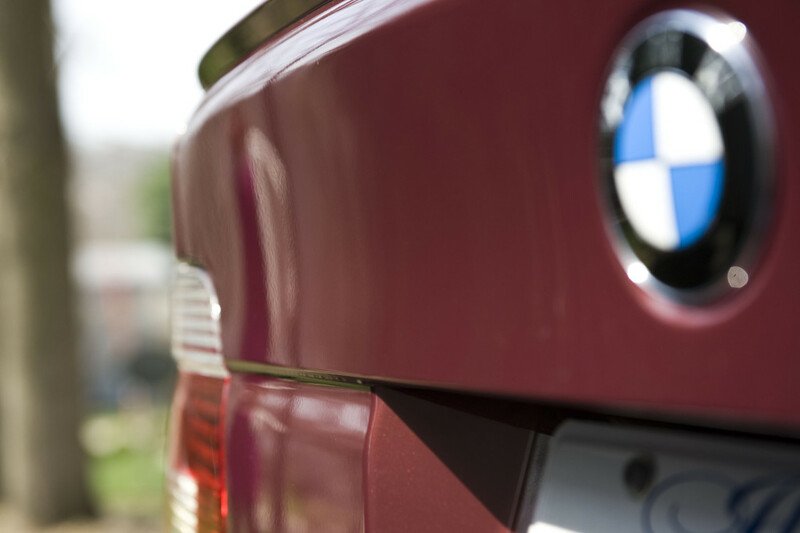 This very clean 1990 BMW E30 came to us in a variety of red shades. Originally, this BMW was painted in a single stage paint, meaning the paint was not topped with a clear coat like most modern cars. 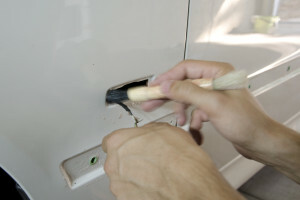 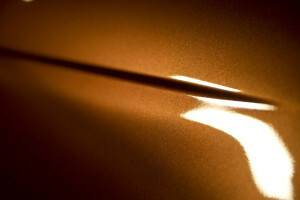 In addition to adding depth to the paint, clear coat serves to protect the pigment from UV rays. 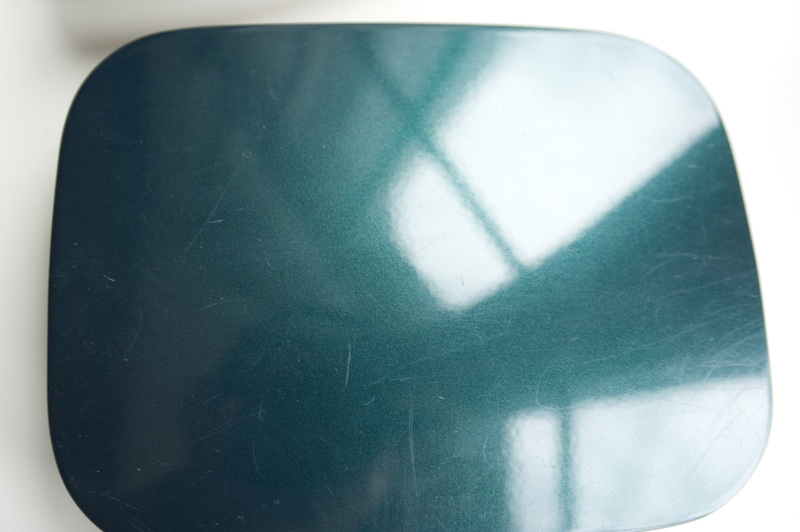 Without this coat, paint can oxidize and lose its luster. The beauty of single stage paint however is that by polishing away the top layer of oxidized paint, you reveal a fresh new coat, while eliminating scratches, swirls and etch marks, restoring its original condition. However, without UV protection, the paint will oxidize again, so in addition to a paint correction, we topped this car with Gtechniq’s EXO; a remarkable product providing UV protection, while leaving a deep gloss and incredible repelling properties for 2 years! We started with a solid cleaning and measured the paint thickness around to car to ensure we have enough paint to safely polish. 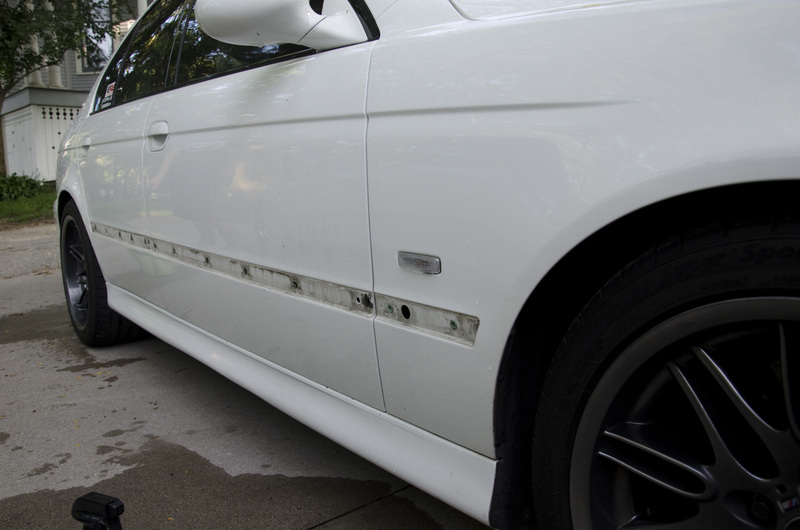 Other than the C-pillars, we had a comfortable working margin, so we were able to get as aggressive as we needed to be to get the job done. That said, we still did a fairly gentle correction to get the stunning results. Progress was slow as we constantly were cleaning our pads to get rid of built up paint residue. 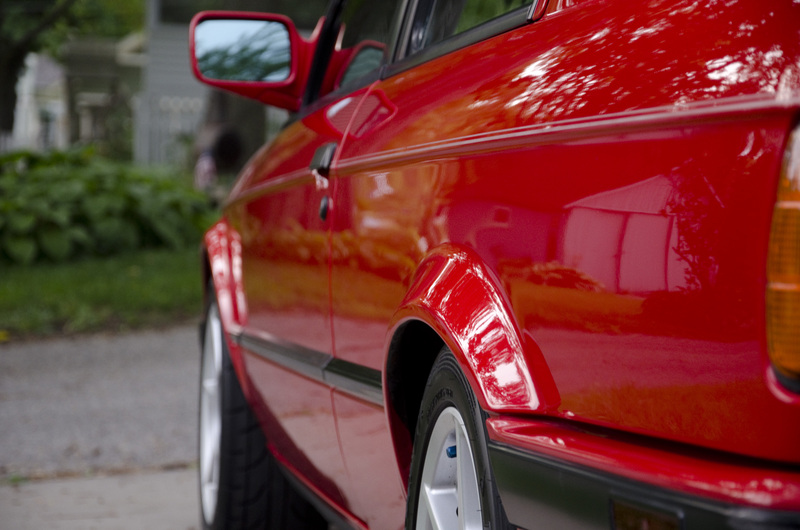 But encouraged with the great results and the E30’s small surface area, we finished the whole correction in a day. Here are some before/after split shots, click any picture to enlarge. 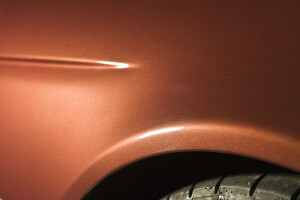 The front right fender was resprayed and as a result had clear coat on it, prior to the correction, it did not match the passenger side door, which was more on the pink side. 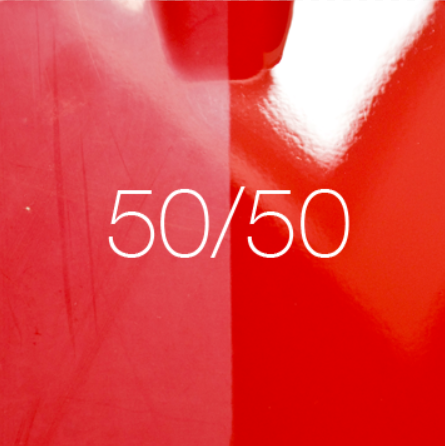 After correction, a remarkable match considering the age difference in paints. 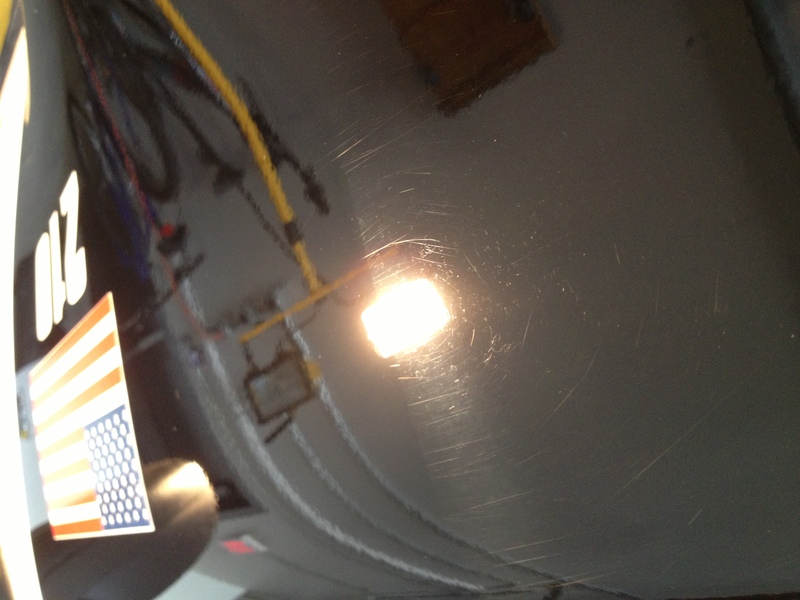 Following the correction, we topped this car with Gtechniq EXO, a quartz based long lasting sealant. 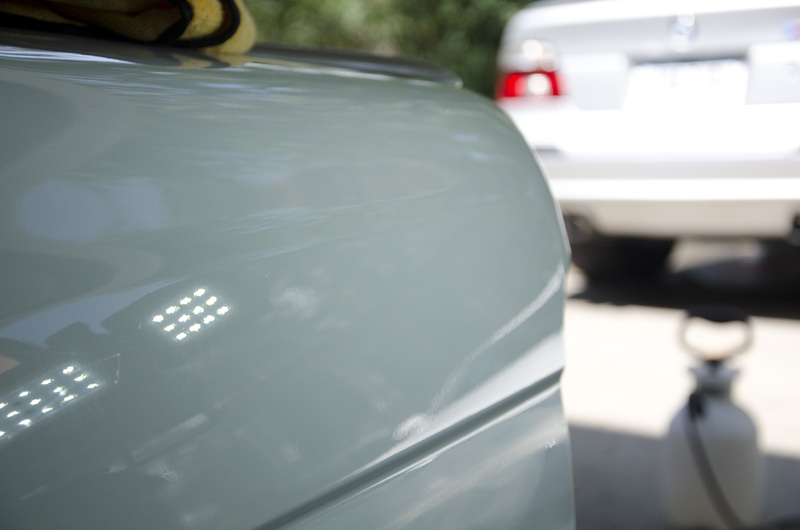 EXO adds remarkable shine and slickness, while offering UV protection and repelling water for ~ 2yrs. 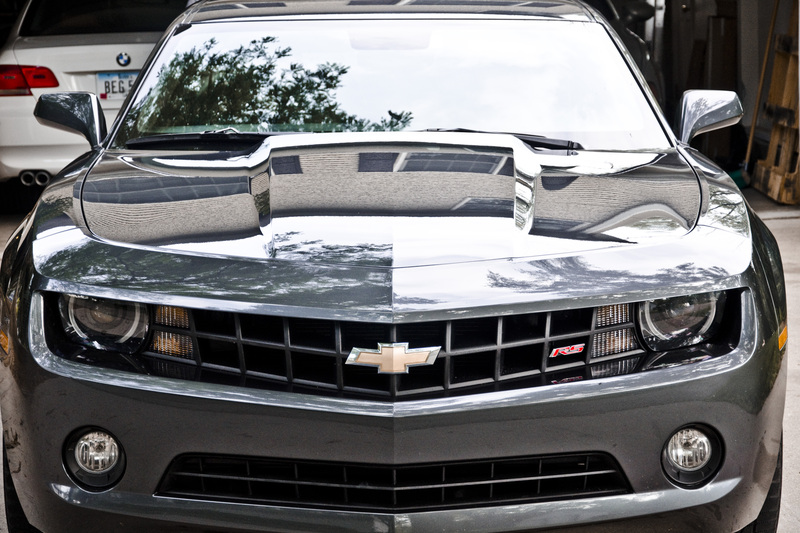 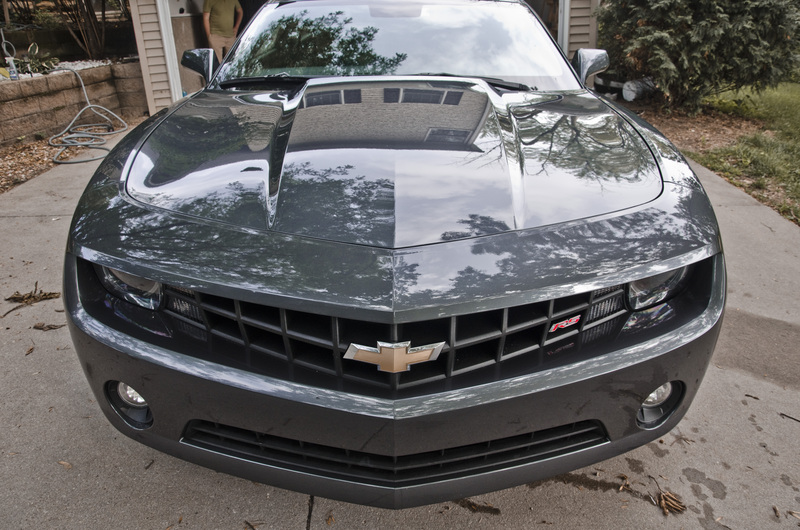 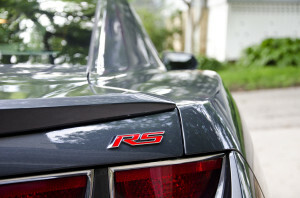 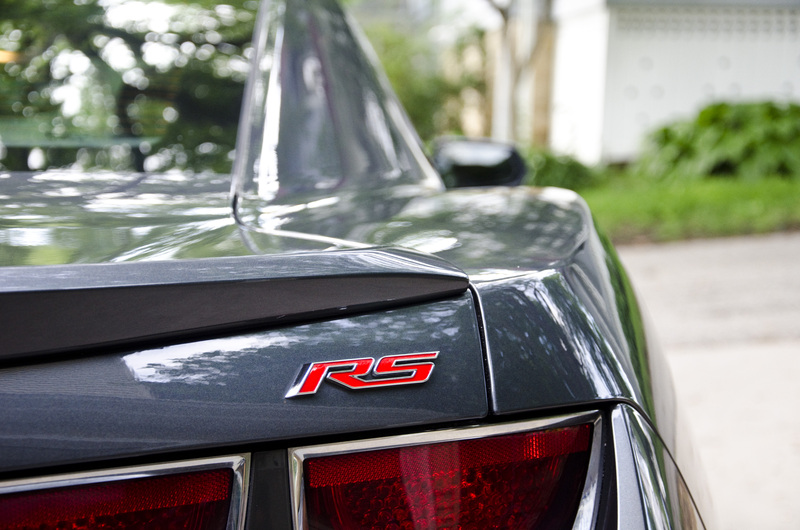 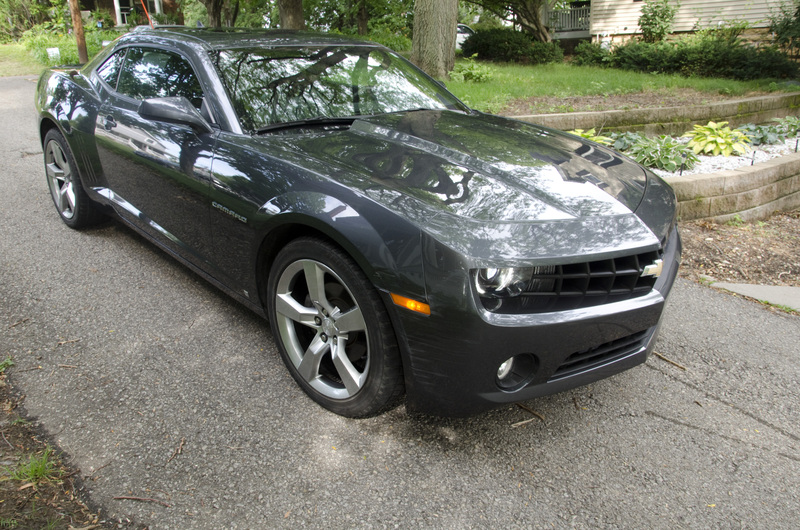 This 2010 Camaro was among the first of the new body style cars to be delivered in Spring of 2009! Wheels got cleaned with Sonax Full Effect, a finish safe cleaner that eliminates brake dust by chemically dissolving it – turning red as it does. Other than the scratched areas, the paint was in rather good condition, we decided on a single stage correction with Optimum Hyper Polish, on a Flex 3401 polisher. 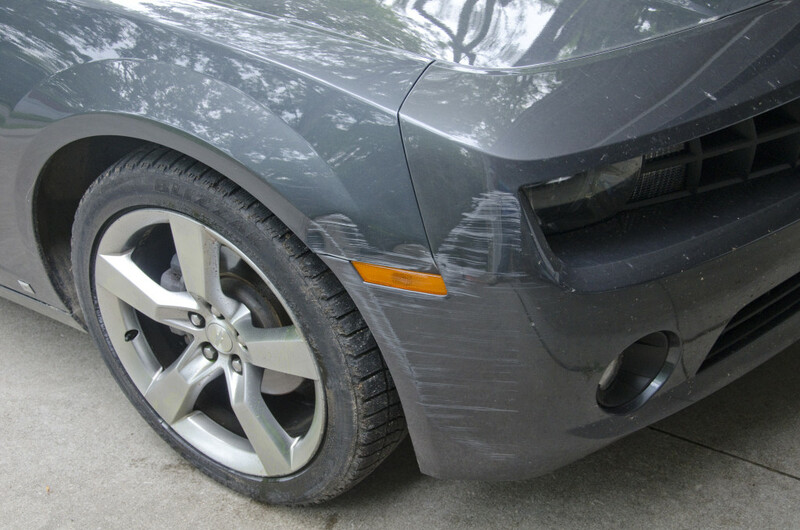 Shine was quickly restored to the Cyber Gray Camaro, as minor scratches and swirls fell victim to the Flex 3401’s unrelenting appetite for defects! Then we focused on this scuff on the wheel arch, courtesy of a garage. 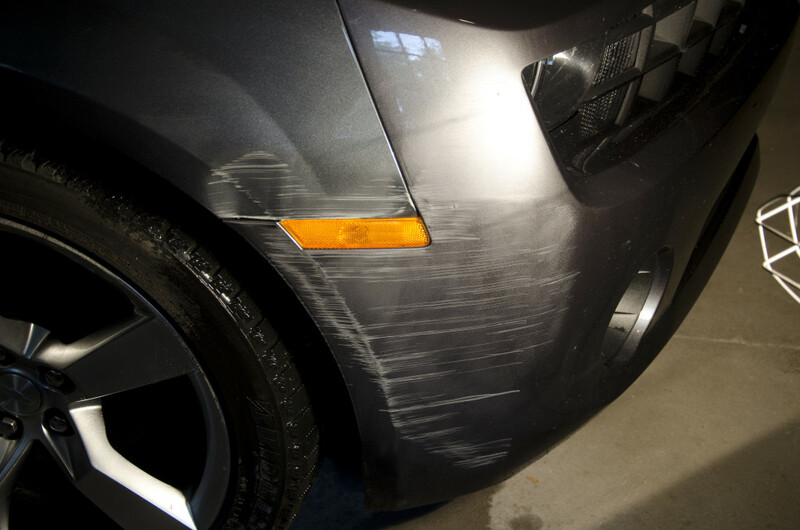 You can tell in the light where the car scraped along some framing. 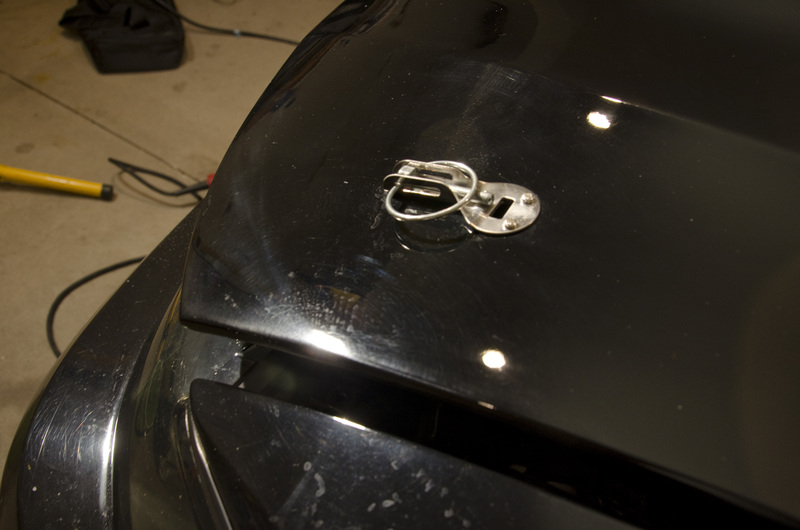 For dramatic effect, we taped half of it off, and attacked the other half with a compound and polish combo. Only a trained eye can spot the defect now if they knew where to look for it. 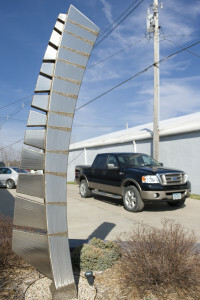 Then there was the cement post.. 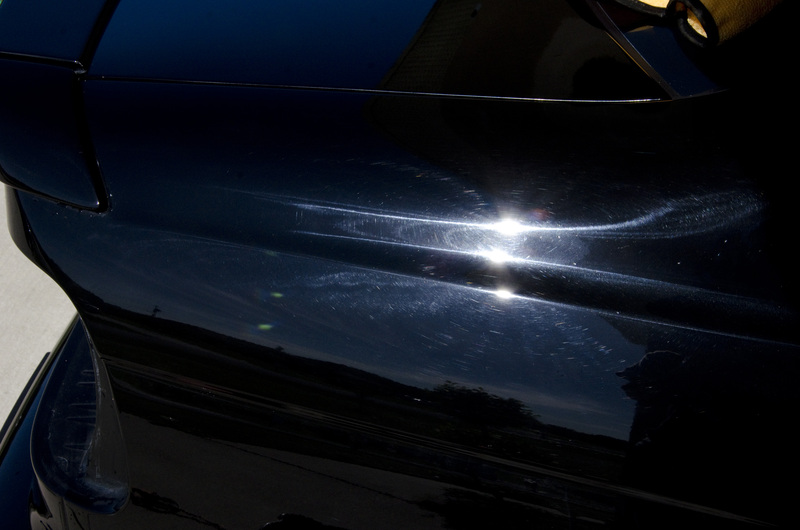 Although many of these scratches extended through the clearcoat, I was confident we could make a difference in appearance and make it less noticeable. For experiment’s sake we started by taping off a little area on the bumper, wet sanding it, and then compound and polishing it. 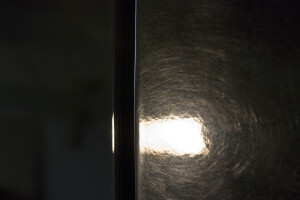 The gray vertical line is where we sanded, to the right of it we polished out the sanding marks – you can tell right away a reduction in scratch intensity. 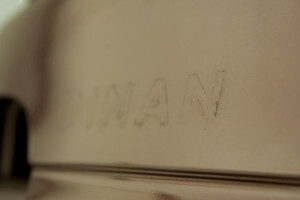 Encouraged by what we saw we did the whole thing. 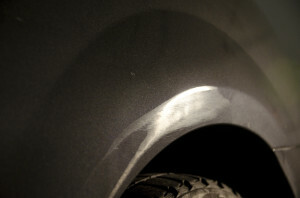 Wet sand first..
Due to the depth of scratched, a complete restoration would require bodywork and a respray. 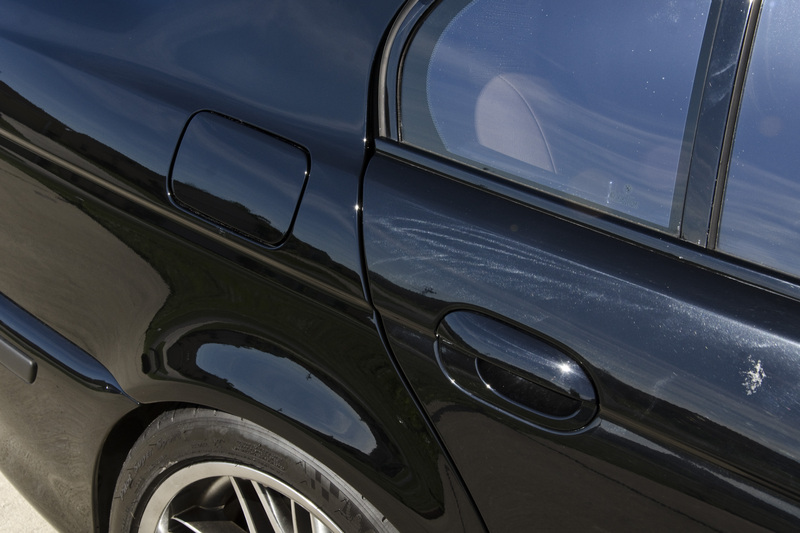 We were able to markedly reduce the appearance of the damage, such that it’s no longer the first thing you notice! 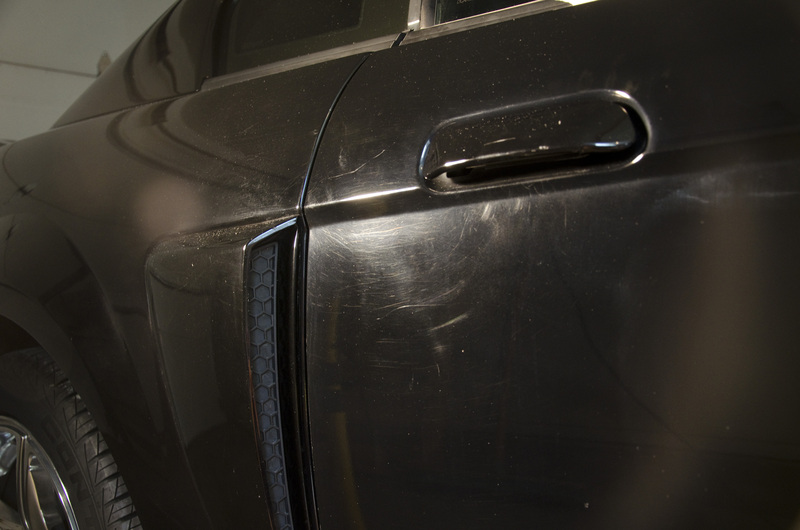 Although we were initially planning on restoring the Mustang’s black paint with a single stage correction and protecting it with opti-coat, it quickly became evident that a single stage correction would not yield results worthy of being topped with opti-coat. 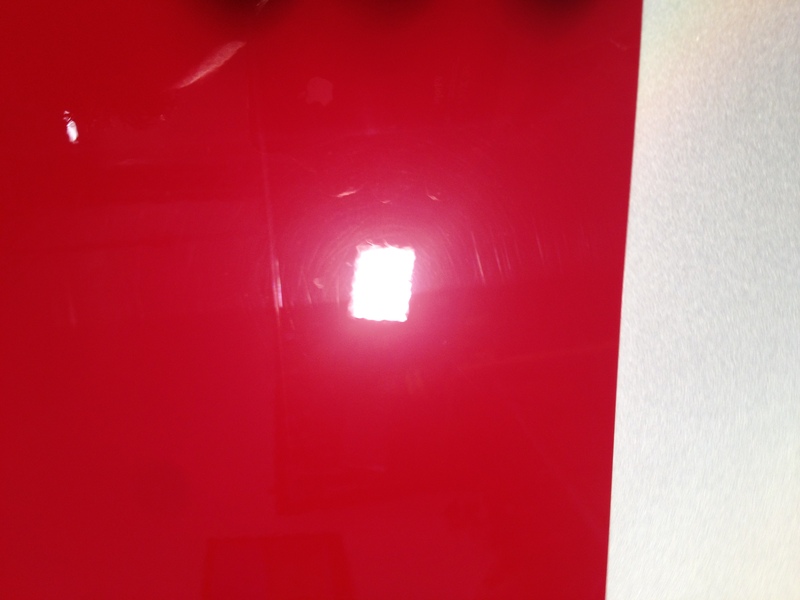 Since we had enough thickness to play with, a more aggressive two stage paint correction was decided on. 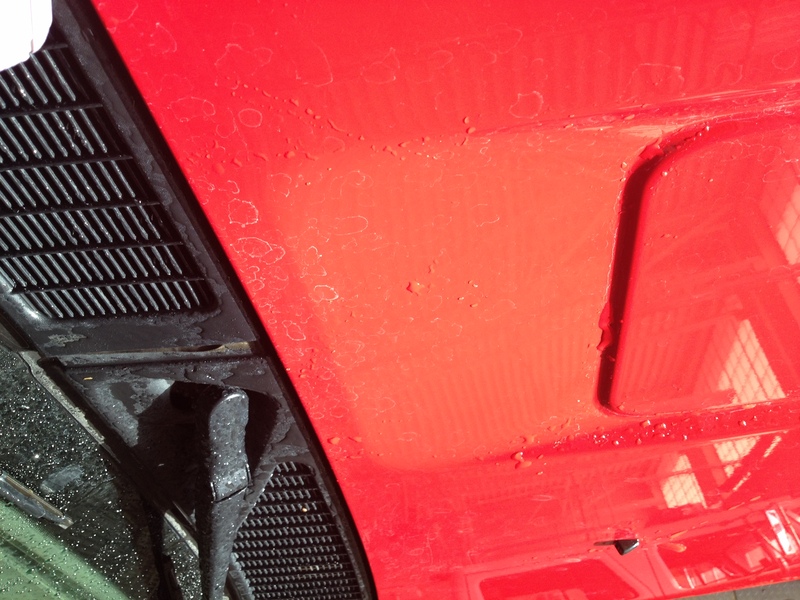 We started with a thorough wash and assessed and documented the Mustang’s trouble areas. 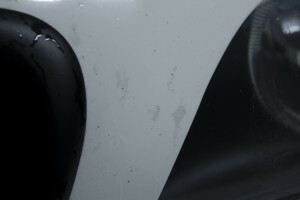 As mentioned, we came across a lot of sanding marks remaining in the repainted areas. 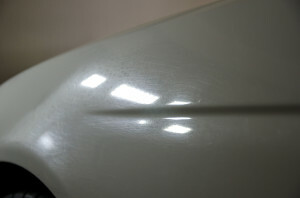 In addition, the non-factory paint was very soft, requiring a lot of care to not reinstall new swirl marks. 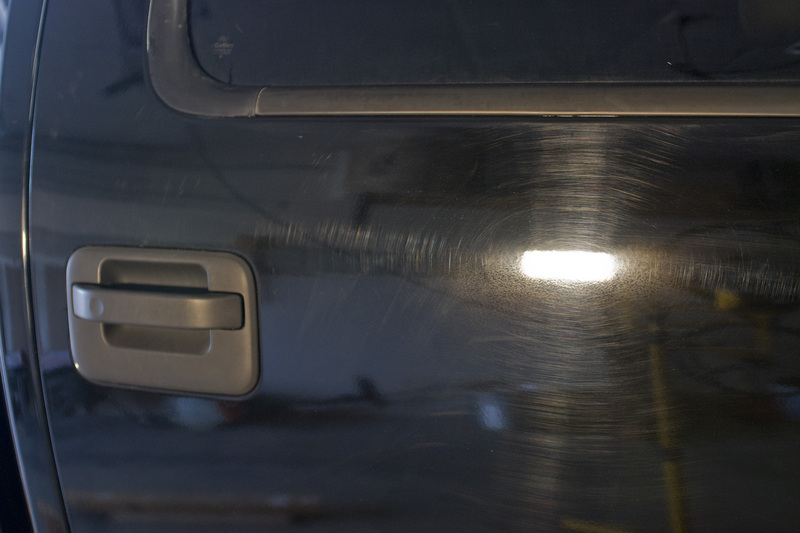 The oxidized areas corrected out nicely, and we got rid of all the previous sanding marks. 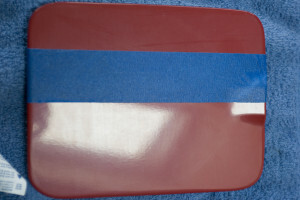 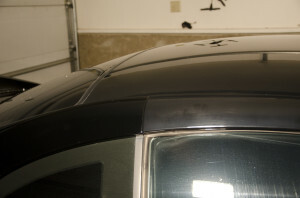 All the plastic trim was treated with 303 aerospace protectant, to keep further UV fading at bay. 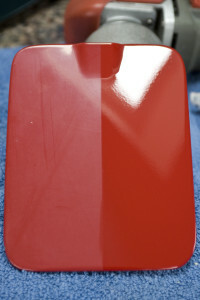 The paint was prepped and Opti-Coated. 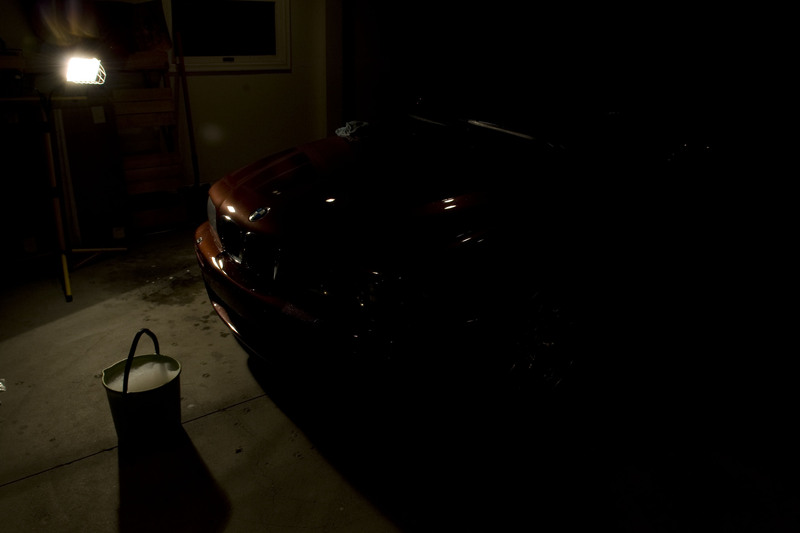 Car was left to cure overnight. 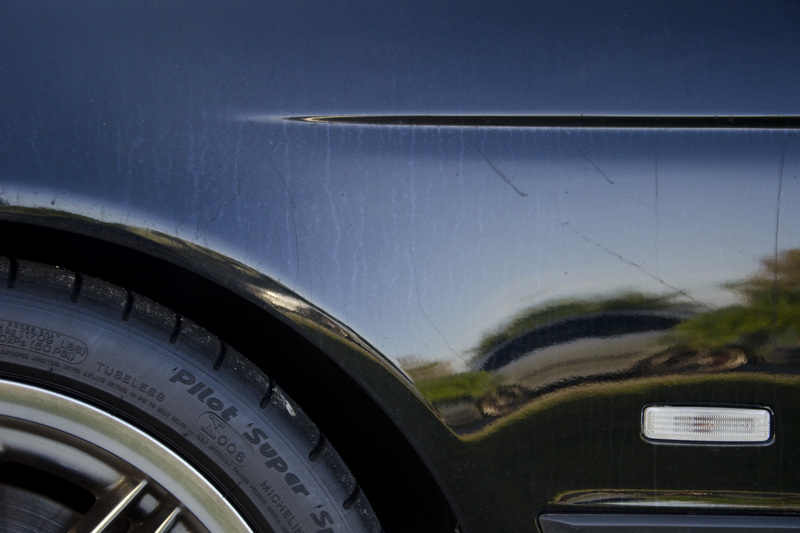 The results speak for themselves, the Mustang’s aggressive styling was nicely highlighted with the unrelenting shine and mirror like finish. 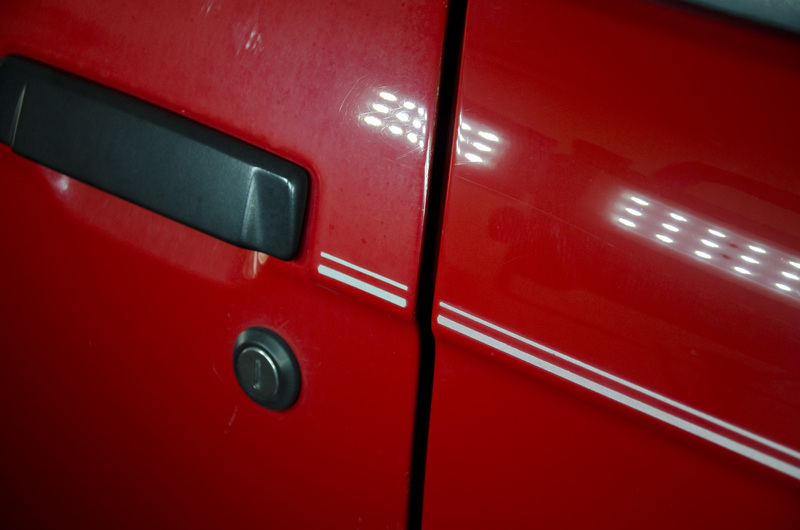 We got rid of the door ding and scratch on the door without using a single drop of paint! 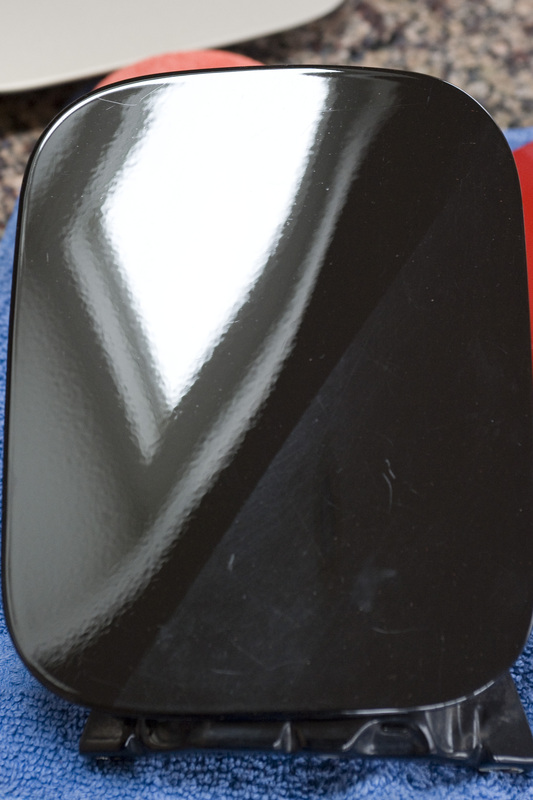 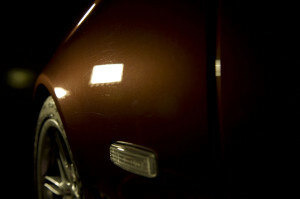 A great case study on the recovery power of a solid paint correction! 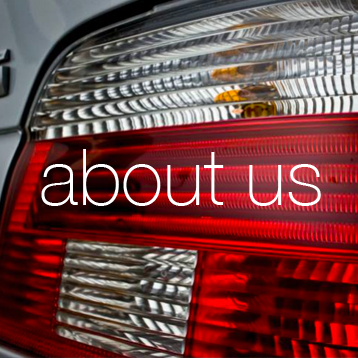 If you have a vehicle you would like us to look at, drop us a line and follow us on Facebook! 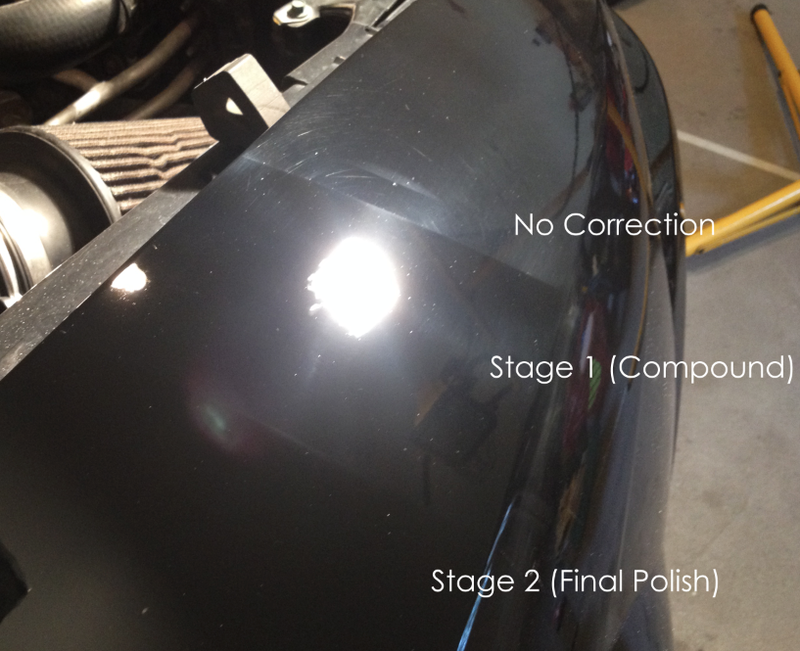 What does a stage 1 correction look like? 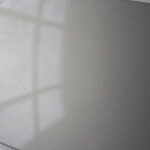 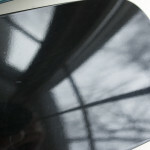 I tend to have a hard time explaining exactly the type of results one can expect with an eM Detailing paint correction. 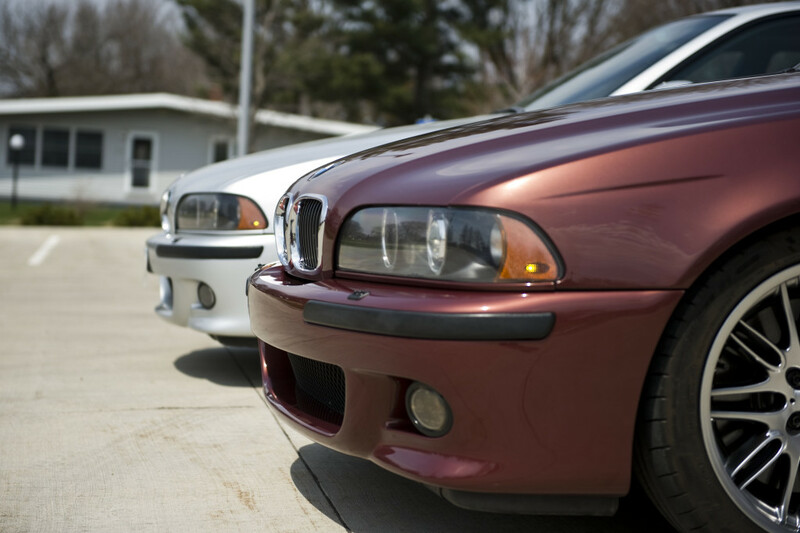 They say a picture is worth a thousand words, I figured a real life sample must be worth more..
From left to right: Hyundai – Volvo – Audi – Audi – Audi (click to enlarge). 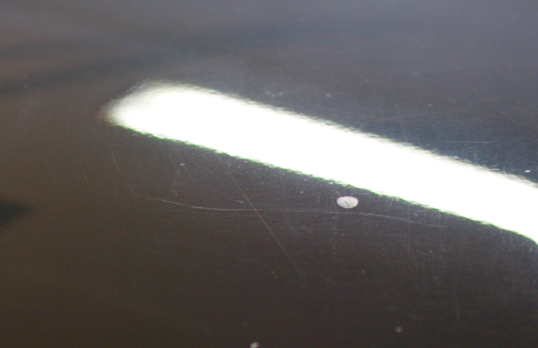 All had some serious surface scuffing and swirling. 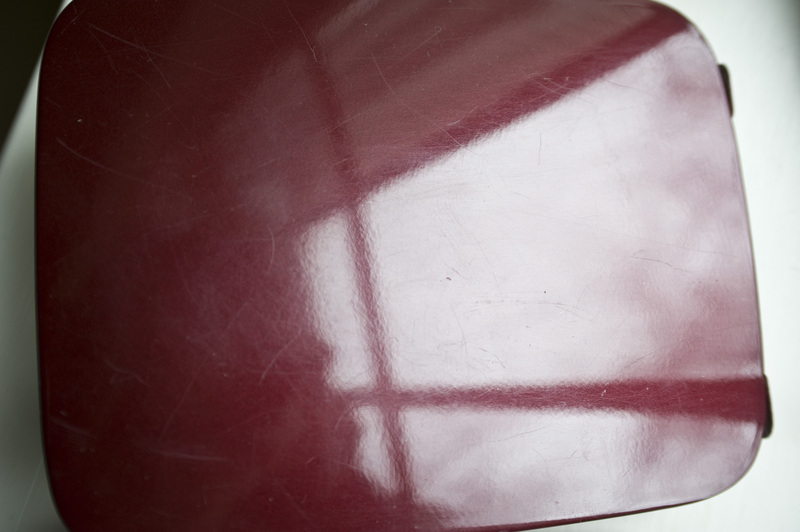 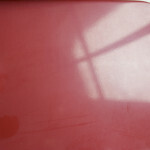 The red Volvo panel, being a single stage paint (without clear coat) had oxidized and faded to a whitish pink. After taping off about half of the surface, I went to work on them with a 3″ griots orange polishing pad on a dual action polisher with Optimum Hyper Polish. 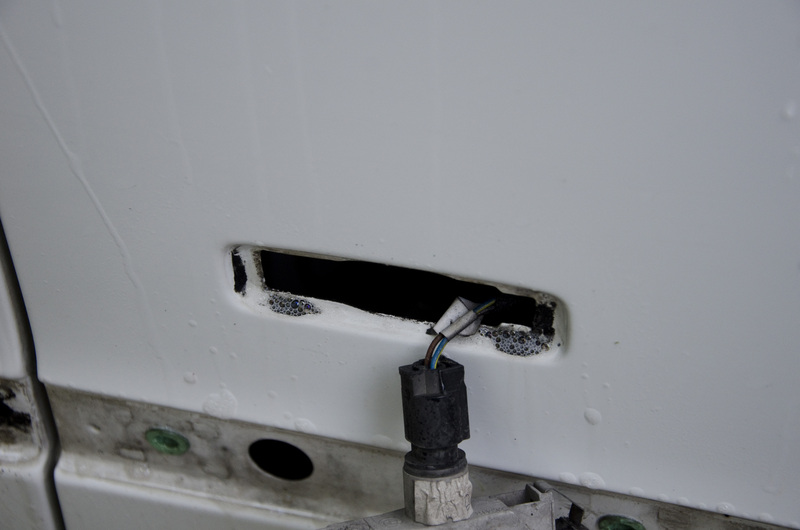 This combination is fairly gentle in terms of removing material. As per eM Detailing philosophy, it doesn’t make sense to us to remove too much protection (clear coat) chasing the few deep scratches – to add protection (Opti-Coat). 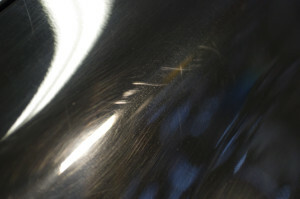 Heavy swirling with some deep clear coat scratches present. 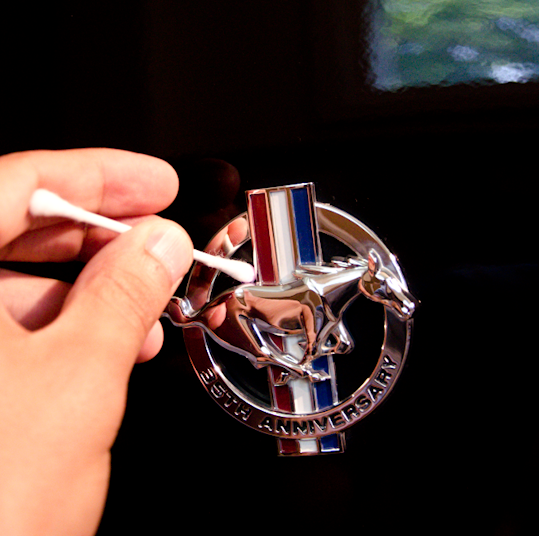 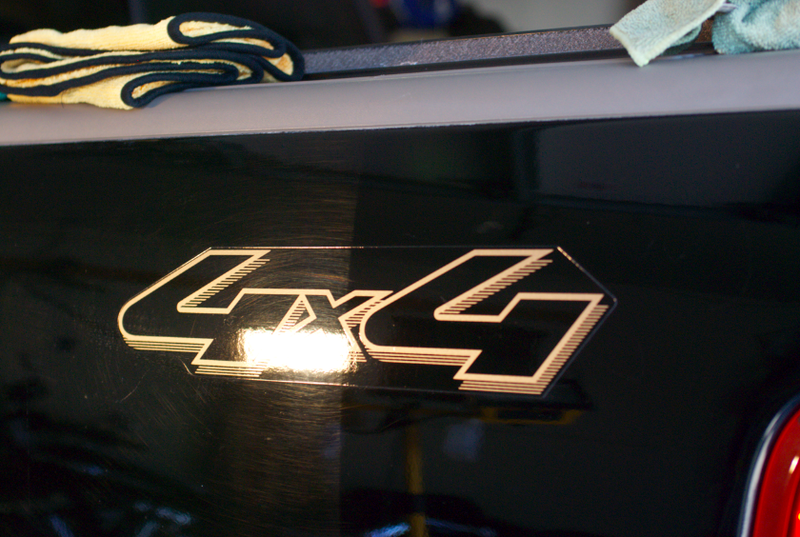 The soft clear coat corrected very nicely with very little effort. I saved the volvo for last, not because I was expecting the most dramatic difference, but because the single stage paint (no clear coat on the pigment) was going to make a red mess of my polishing pad (with polished off paint). 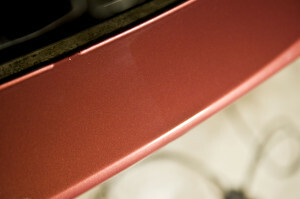 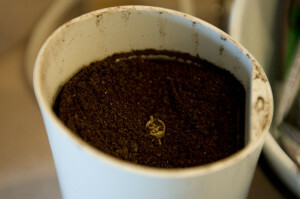 Still, this gentle setup was adequate to remove the oxidation revealing a fresh and rich red underneath. I hope this gave you a better idea of the type of improvement possible on your car. 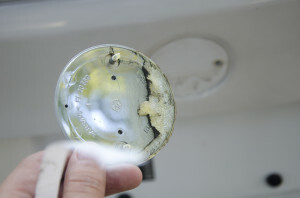 Even though these samples came from a junkyard, this surface condition is not uncommon on normal cars. 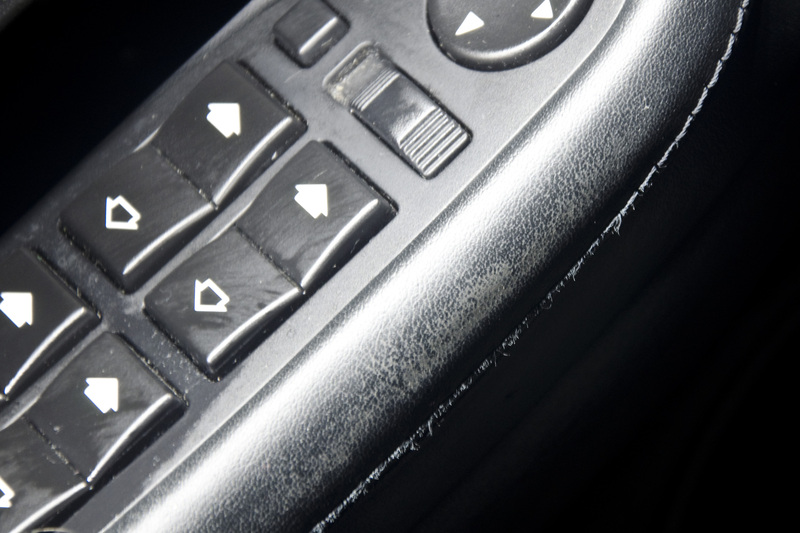 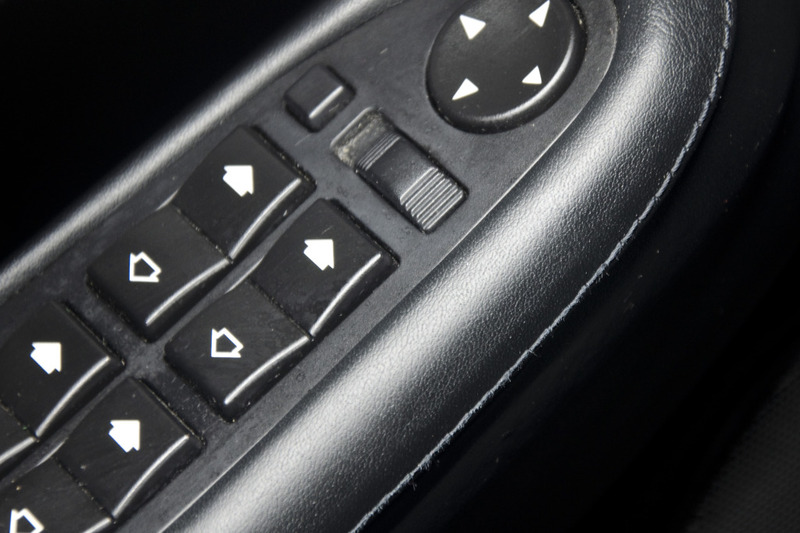 In fact, vehicles come with swirls and scuffs from the factory! All but the Volvo were from the mid to early 2000’s, really not that old. 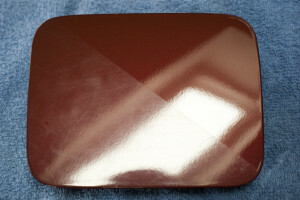 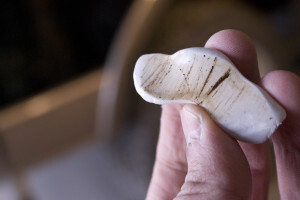 This type of swirling is the results of improper washing techniques, and once corrected, can be prevented with the application of hard wearing top coats (such as Opti-Coat) and a proper washing and drying routine. 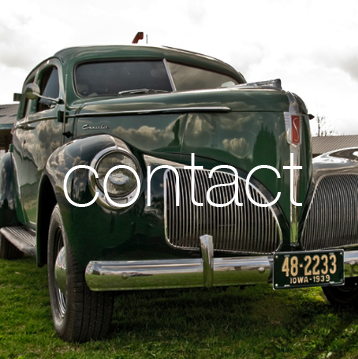 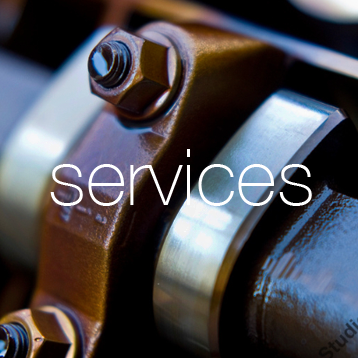 If you are interested in getting a quote for restoring your vehicles to its showroom days, contact us for a free consultation. 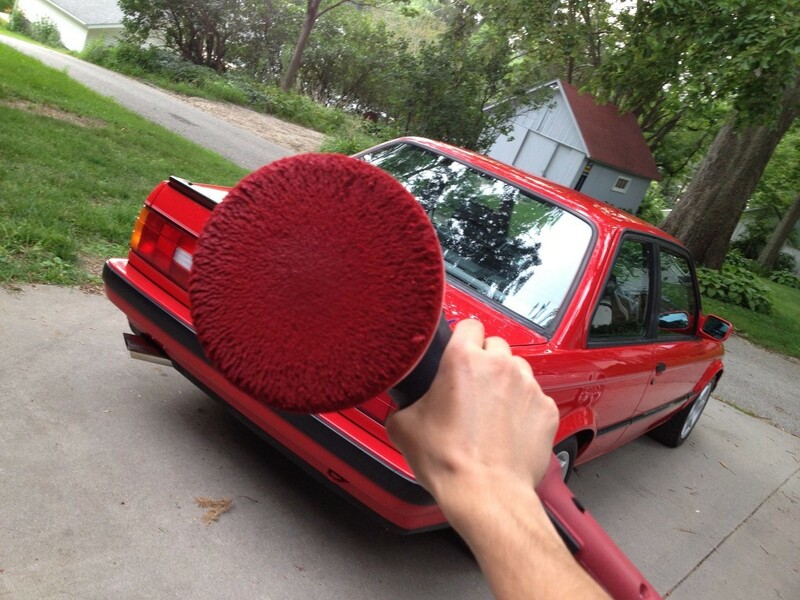 As a teenager, I would not even think twice about washing my car constantly, and waxing at least once a week! 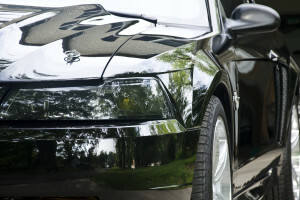 My time and energy was endless, and I tell you, I had one of the shiniest 20 year old SAABs around! 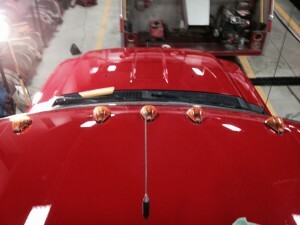 I learned detailing at my first job. 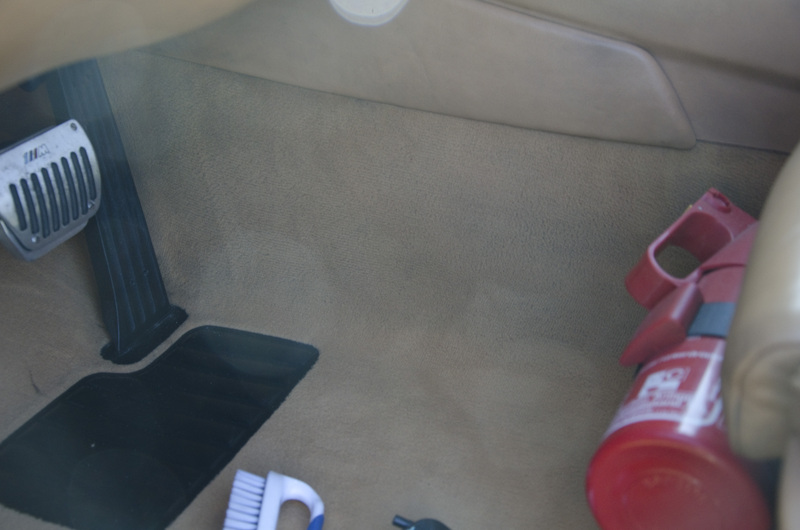 It, however, was mostly a wash, vacuum, and wax operation. 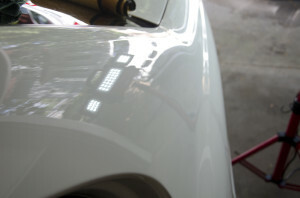 Like most detailing operations, there was no time to get any real paint correction done. 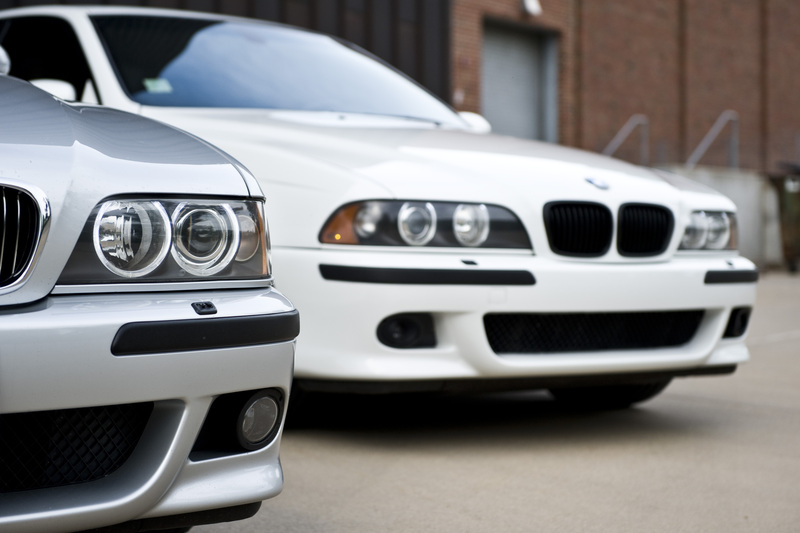 Protect your dream car, or your daily warrior! 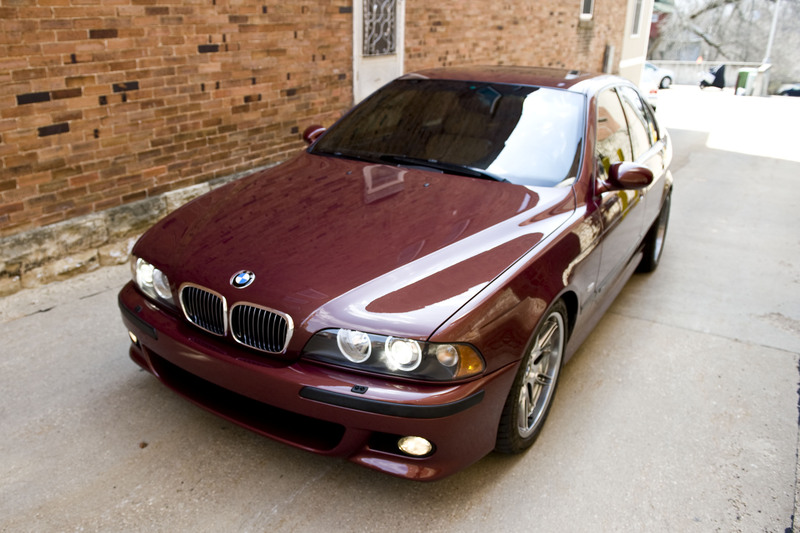 Fast forward through college, where time and washing opportunities were limited, I needed to be more discerning with how and when I kept up my then 10+ year old BMW e34. 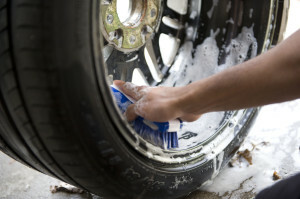 I learned to wash in dorm parking lots with no rinse washing techniques, originally developed for water restricted places, and picked through waxes and sealants to find long lasting protection. 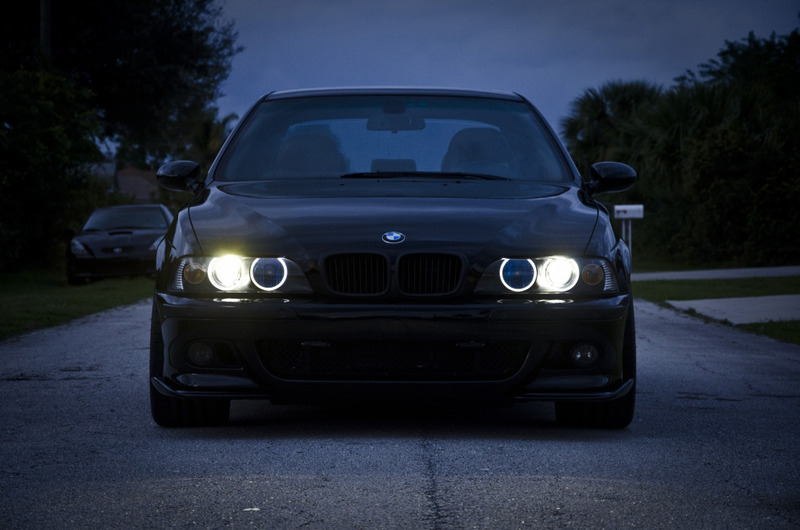 When life finally afforded me the opportunity to buy my dream car, the e39 M5, I knew I had to find a way to keep it protected and looking its best with the little free time I had. 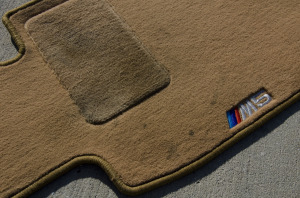 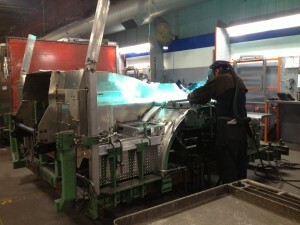 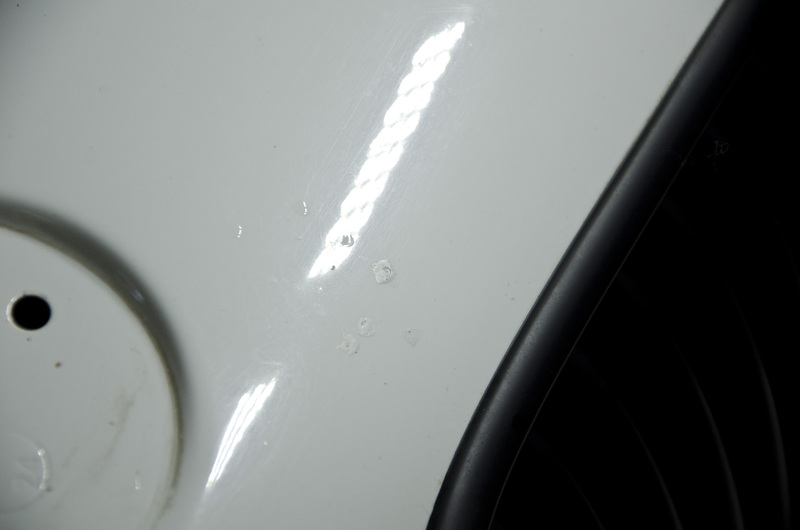 eM Detailing’s methods meet two simple requirements: They must be effective and durable. 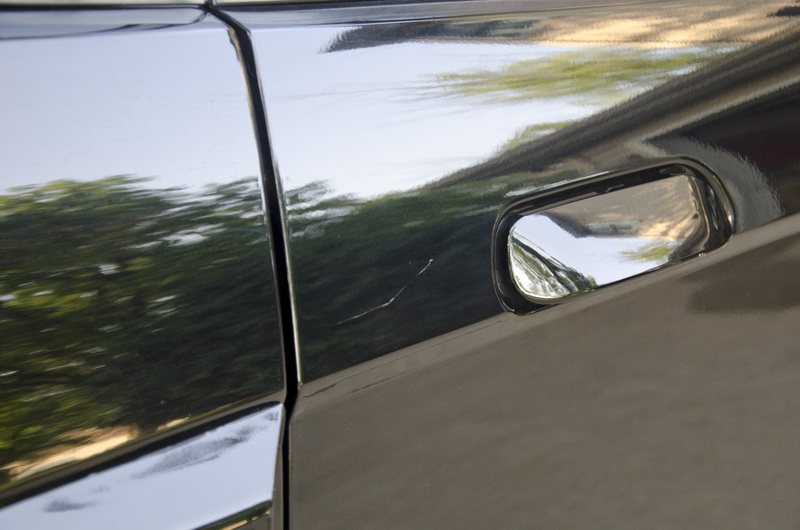 To be effective, we start with the paint, or the clear coat rather: The process of car ownership scuffs and swirls the clear coat. 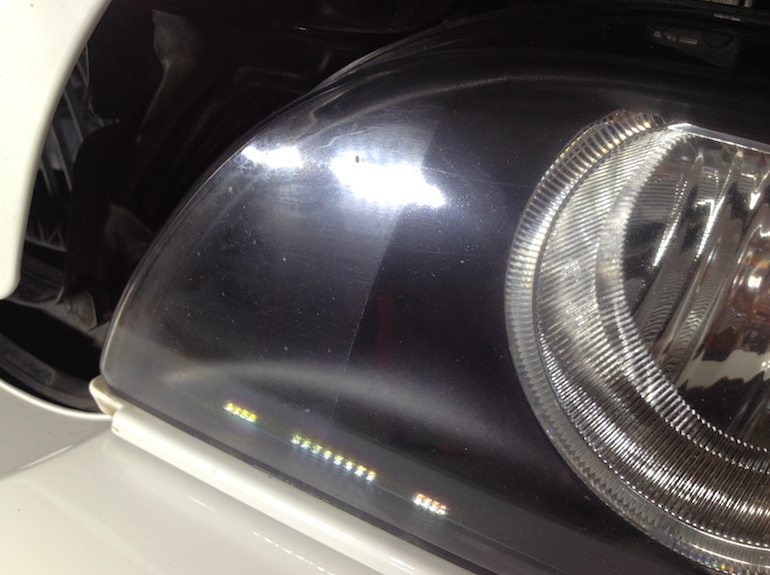 These swirls, although barely noticeable under normal light, look like a nest of spider webs under high output lights. 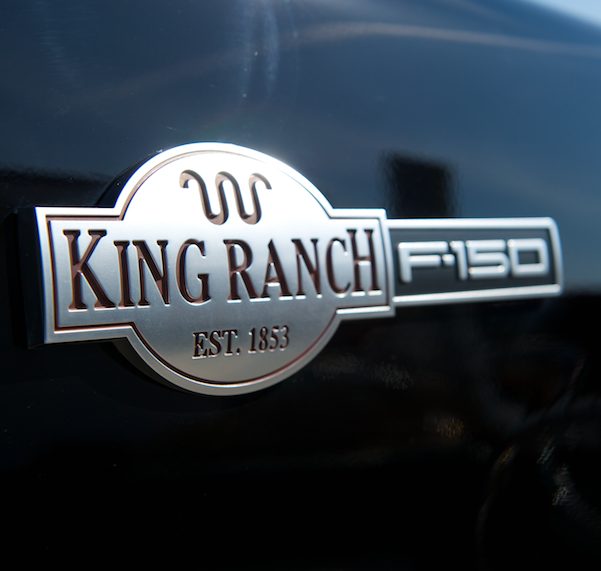 These fine scratches get in the way of a deep gloss, regardless of how much wax you put on top of it. 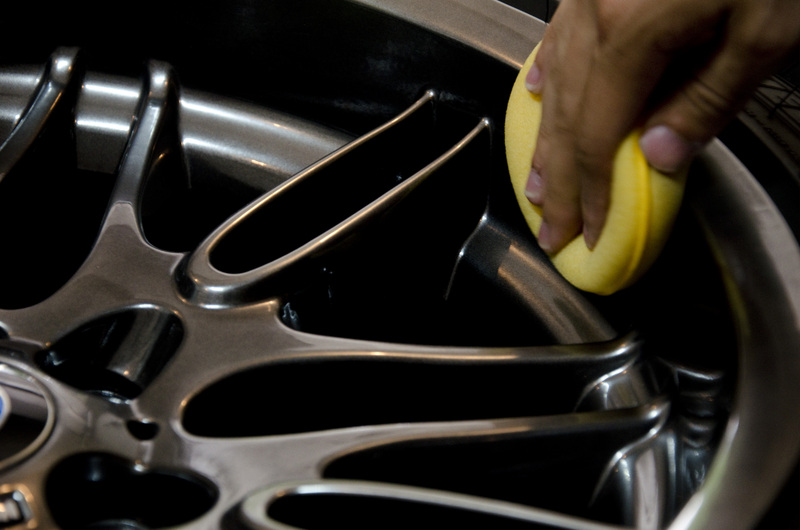 We spend the time to polish these out, carefully! 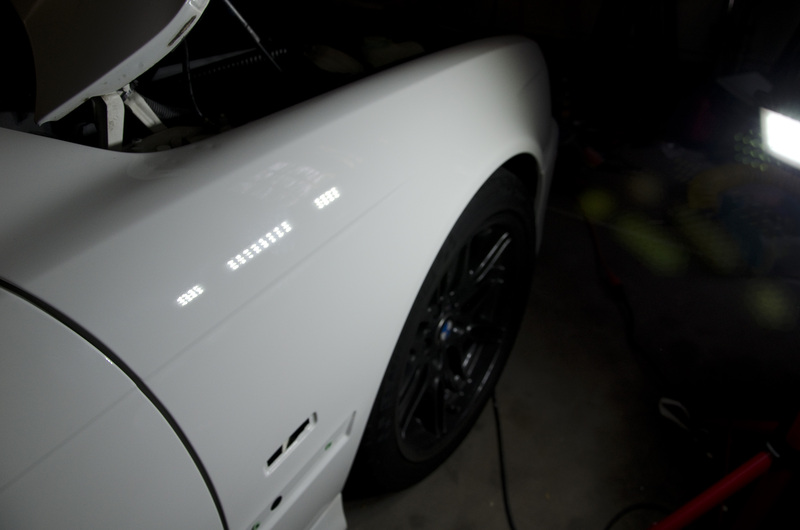 This is the paint correction step, and what takes the most work. It is also the step that pays huge dividends. 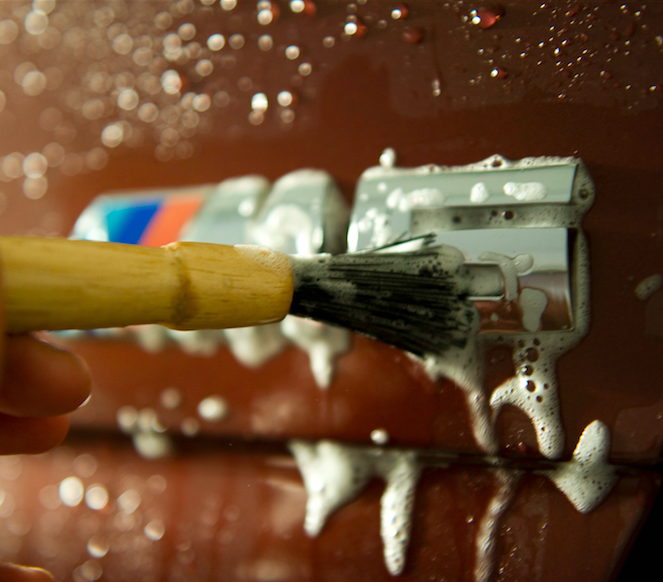 To protect the freshly polished clear coat, we top it with a tough ceramic clear coat, that will permanently add water and dirt repelling qualities! 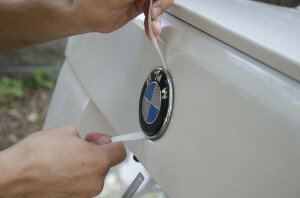 This protection does not wash off, does not need to be repeated, and will make future car washing quicker! 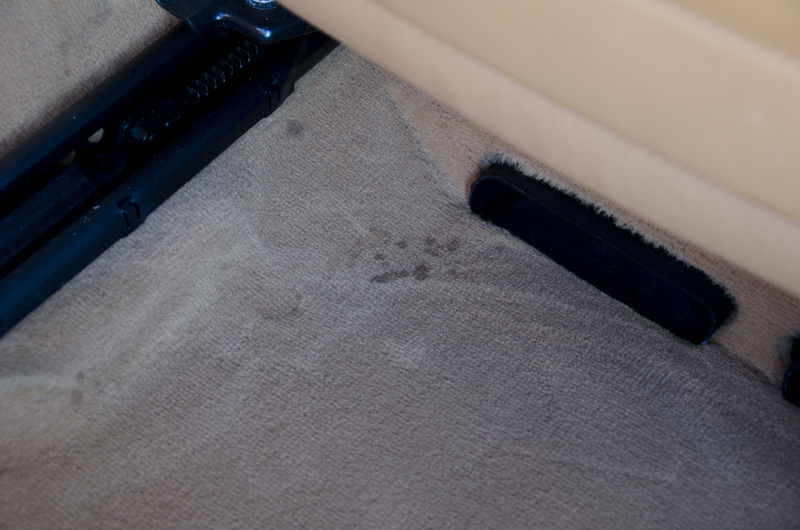 Although you do not need to wax any longer for protection, some still choose to, as it gives them something to on a Sunday afternoon! 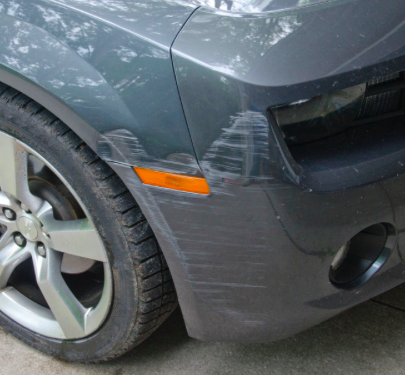 For long term protection, we stay away from waxes for a few reasons. 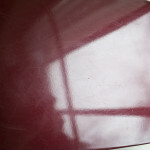 Mostly, it is temporary. 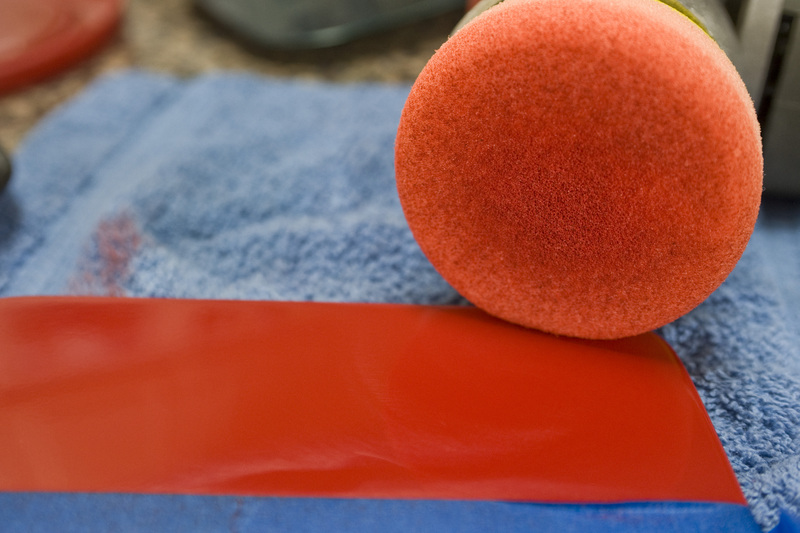 Application and reapplication involves rubbing the wax on, and rubbing it back off. All this friction increases the chances of scratching the polished surface again! 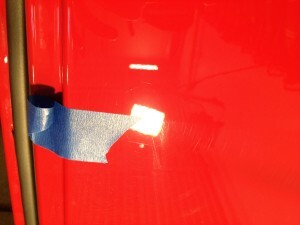 Wax only adds a minute layer on top of the paint. 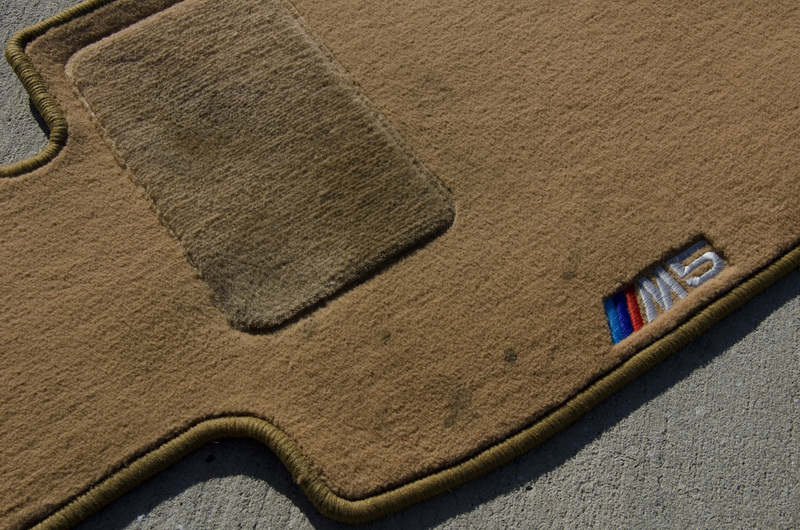 This offers no real protection against the outside world. 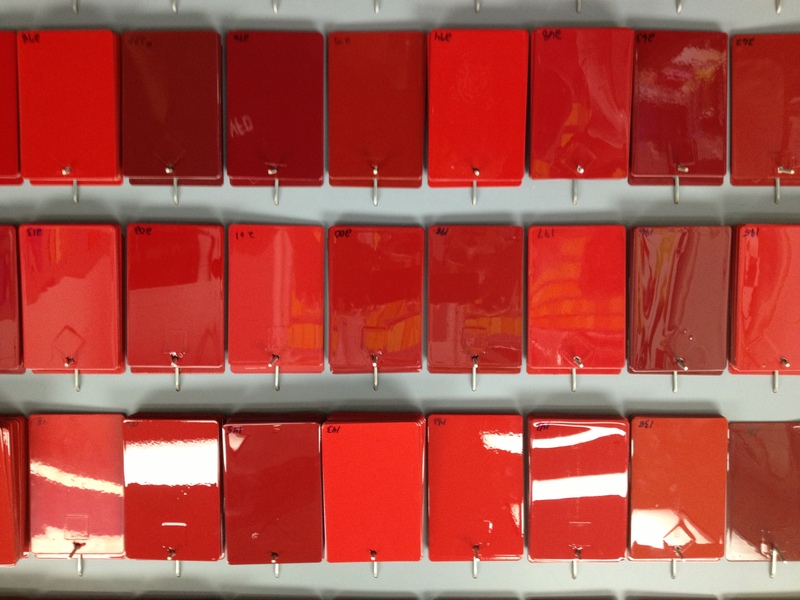 The ceramic clear coat we apply adds real thickness between your paint and the elements. 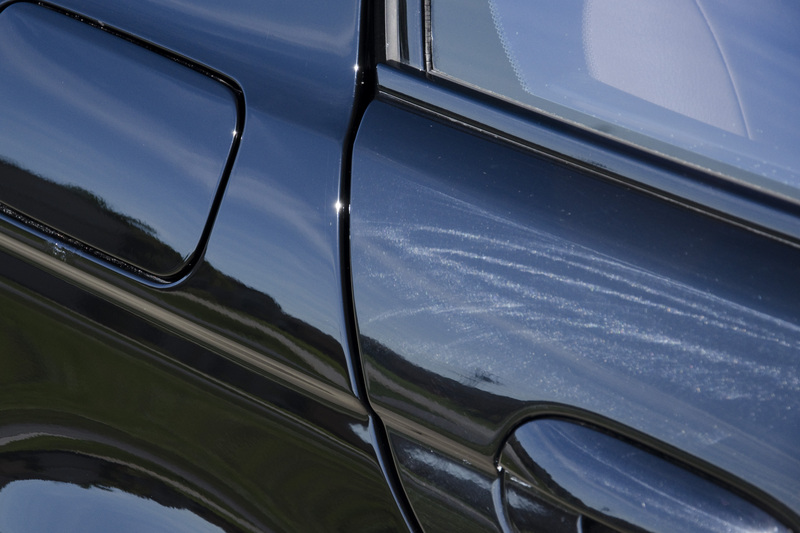 Thickness, if worse come to worst, we can use to polish out scratches, and start with a new finish, without having to sacrifice your car’s original clear coat. 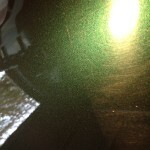 Call or email us for a free estimate and sample detailing. 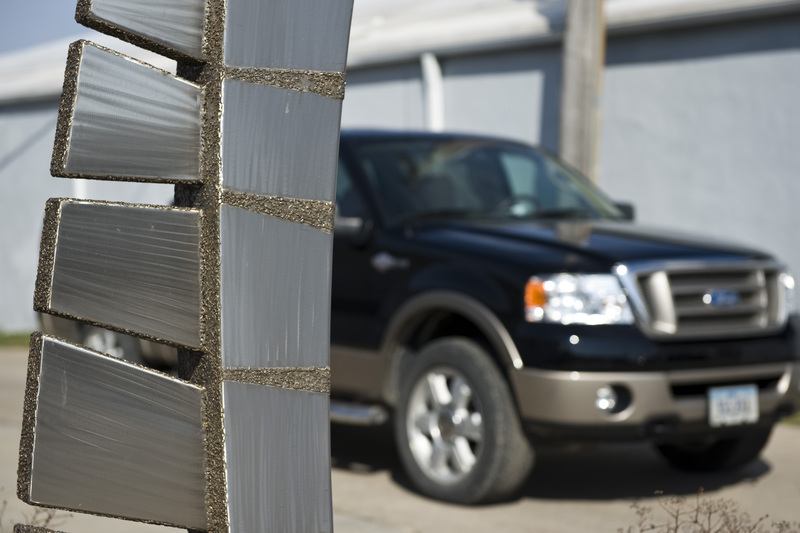 we are located in Mount Vernon Iowa, and will come to you! 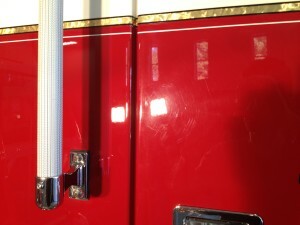 The fire department I serve on as a volunteer just invested in a brand new engine from Pierce Mfg. I was able to visit the Pierce factory in Appleton, WI and see how these remarkable pieces of equipment are built from scratch to each individual customer’s exacting specifications. 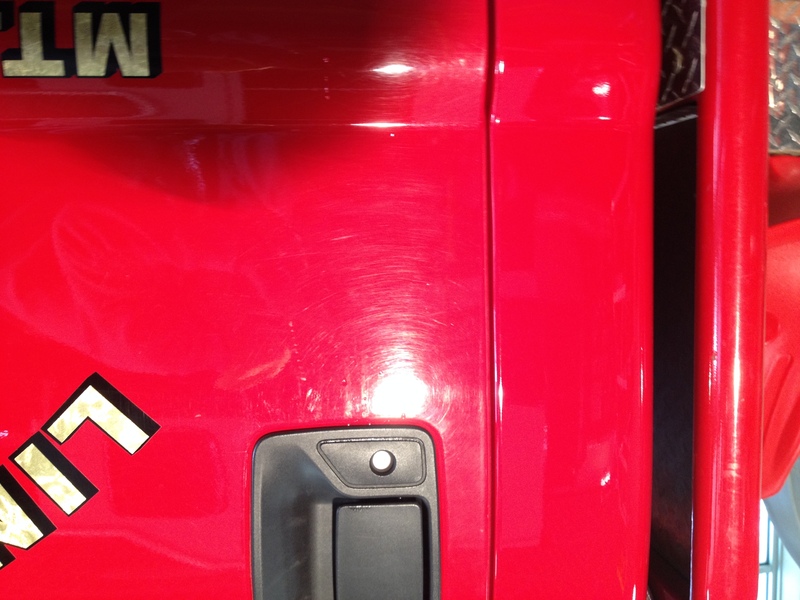 Naturally, with anything new and shiny, we want to protect it and keep it looking its best, so eM Detailing donated a polish and coating to keep this truck looking its best, while testing our methods on a large scale! 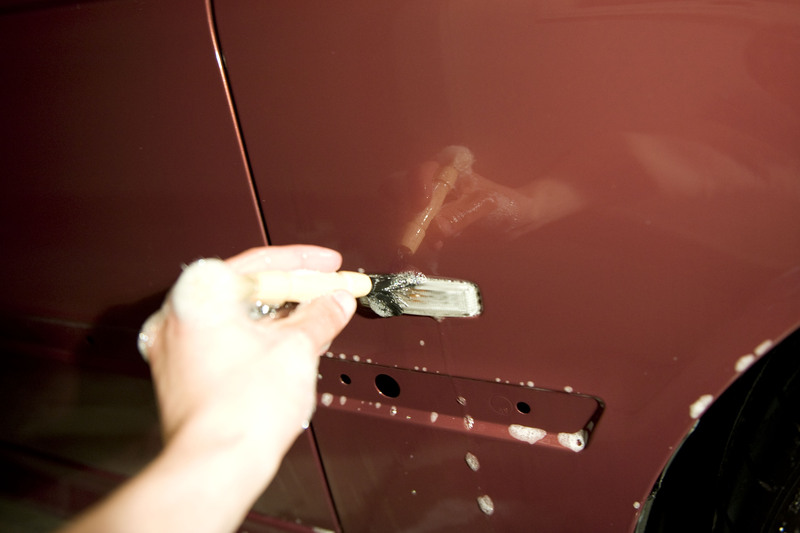 Depending on the composition of the paint/clearcoat, some coats are rather hard and resistant to scuffing, this truck’s paint unfortunately was quite soft. 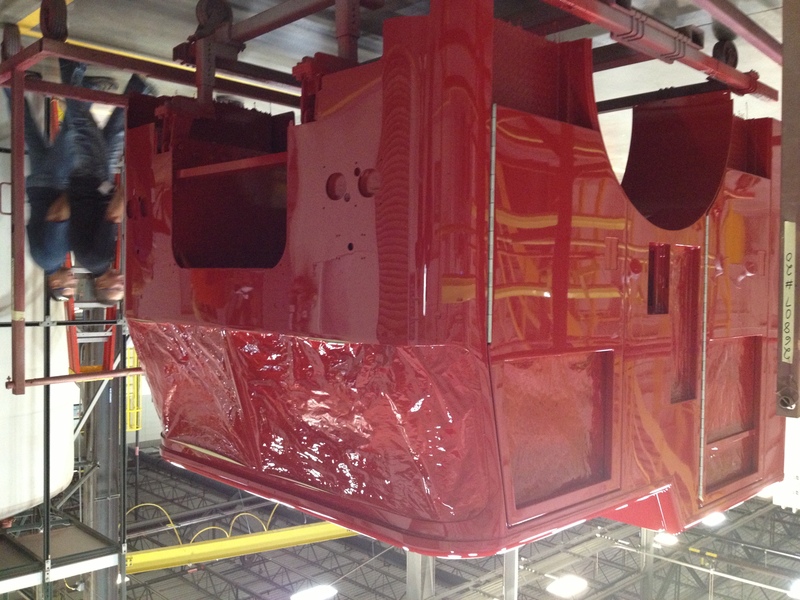 Despite Pierce’s best efforts in protecting the paint at the factory, the soft fire engine red paint scuffed with remarkable ease. 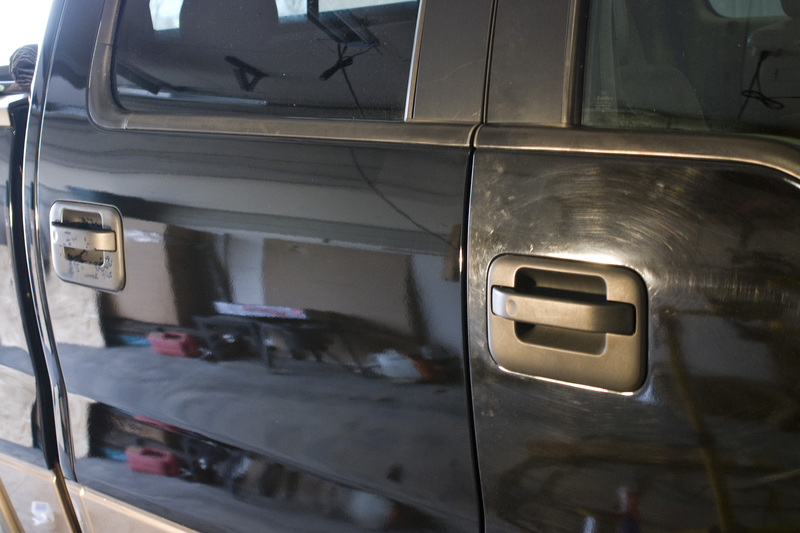 Factor in the nearly 300 mile drive back, and this truck was not the pristine shape desired prior to coating. 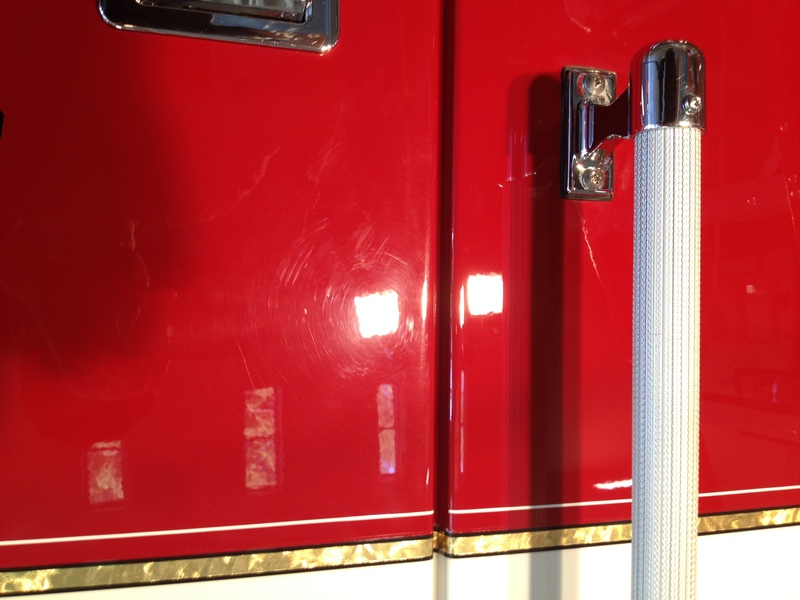 After polishing about a zip code worth of firetruck paint. 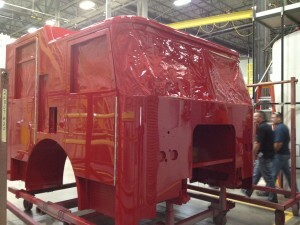 The truck got its surface prep, and was Opti-Coated. 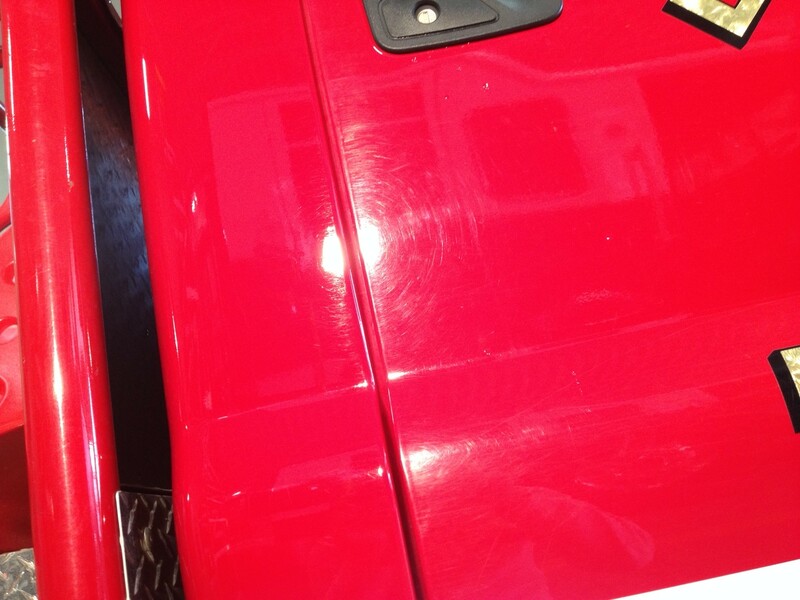 The truck cured and we will follow up with this after we get the truck good and dirty. Not wanting to remove too much clear coat, we only did a polishing step to get rid of most the lighter scratches prior to Opti-Coat. Here are some after shots and 50/50 comparisons. 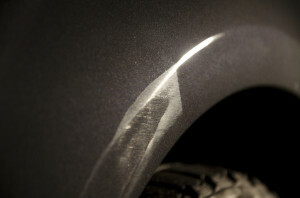 You can tell some of the deeper scratches are still present, but overall there is a greater lustre and dept to the paint. 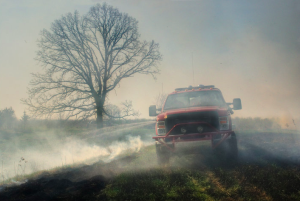 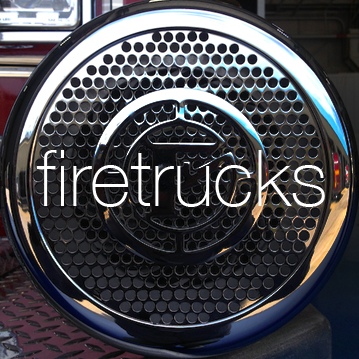 We will follow up with this truck as well once we get to grass and field fire season this spring. 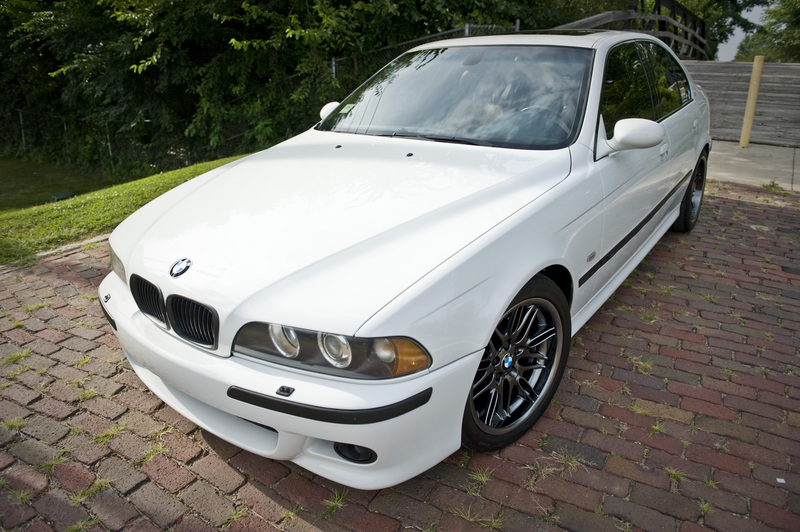 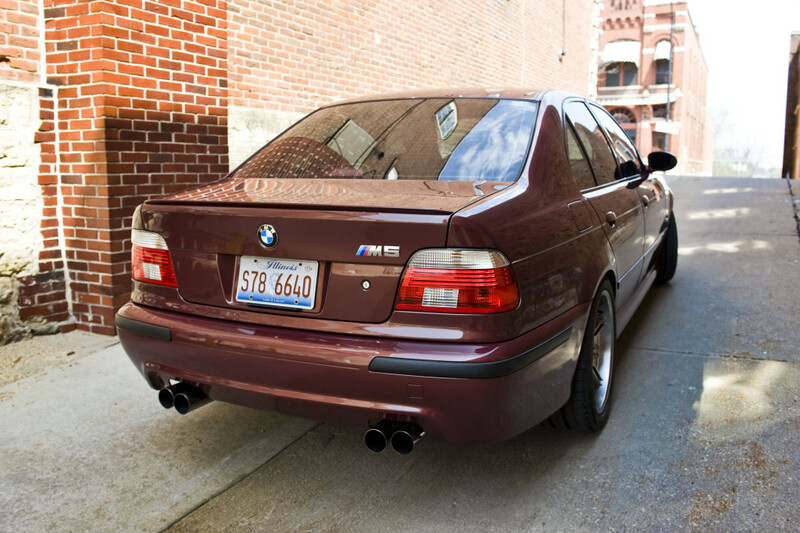 This 2002 BMW M5 came to us all the way from Illinois for a paint correction and Opti-Coat application. 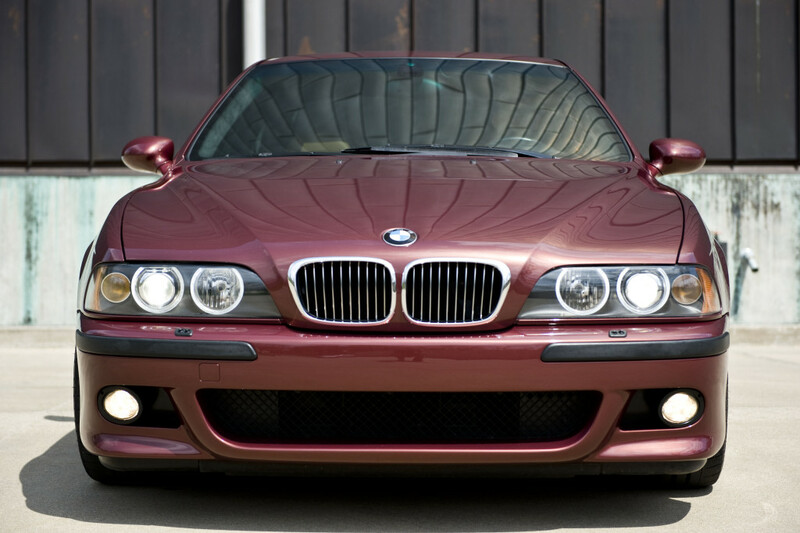 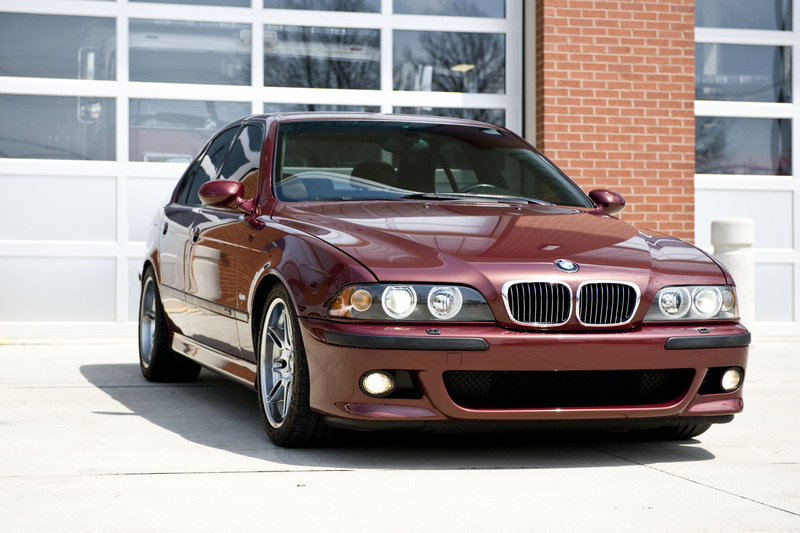 This e39 M5 arrived Friday evening – to be picked up again Sunday noon. 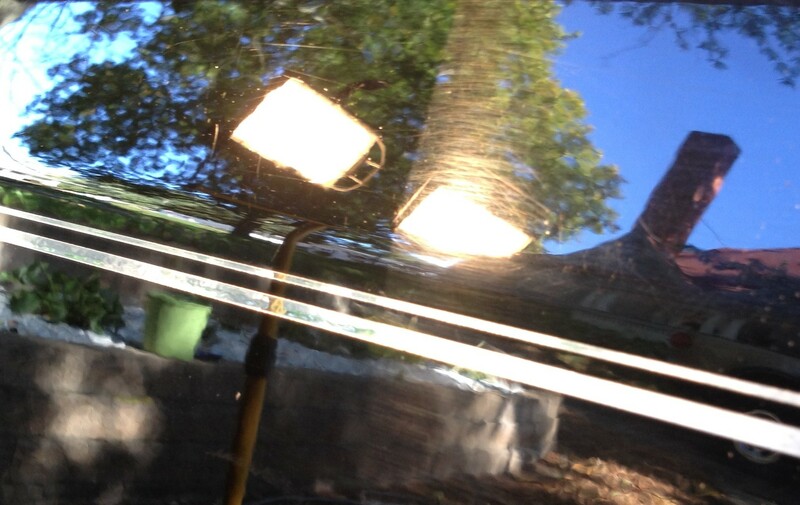 Since there was rain forecast for Sunday (rain that never did come) I set out to have the car fully coated by Saturday night, to allow for the most cure time before it had to get out in the rain. 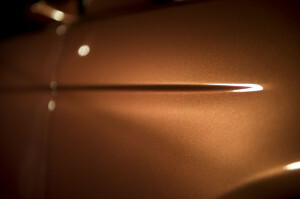 The late night low light and schedule constraints of this detail, along with the color’s forgiving nature, did not produce the usual amount of dramatic 50/50 photography, but in person, it was easy to see that our hard work was going to be rewarded with a significant depth and clarity increase. 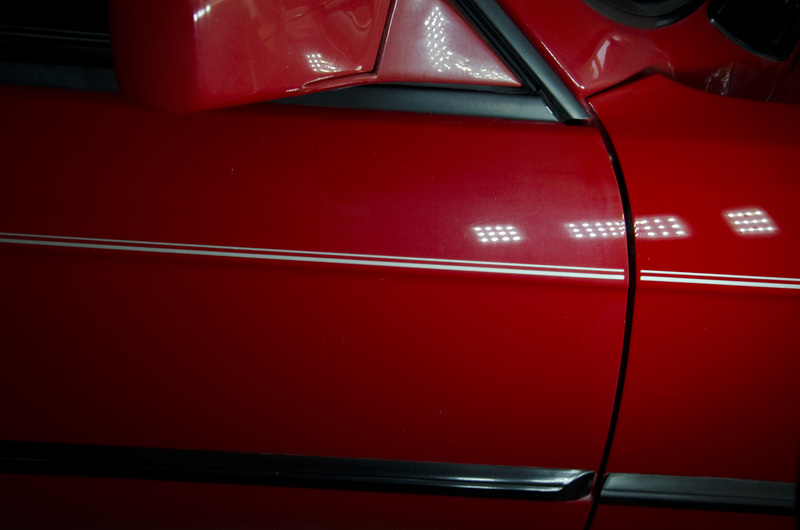 As we worked on under the scrutiny of hot halogen lights, we really got to appreciate the full dynamic color range of the Chiaretto Red paint. 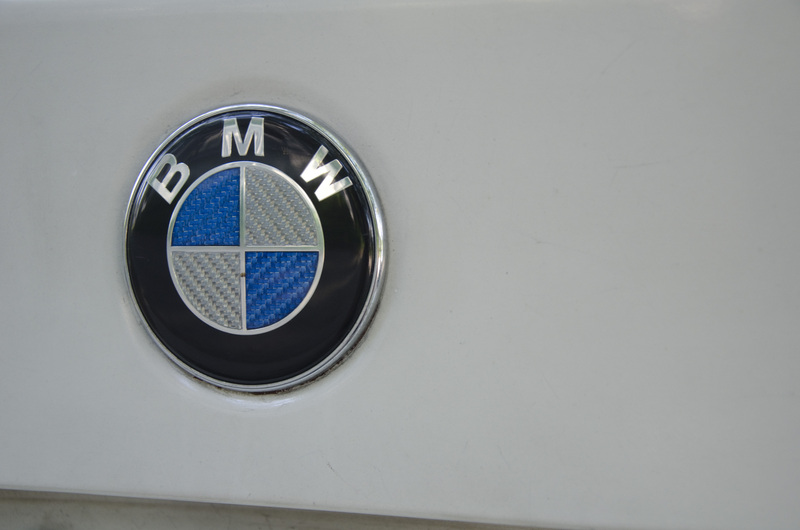 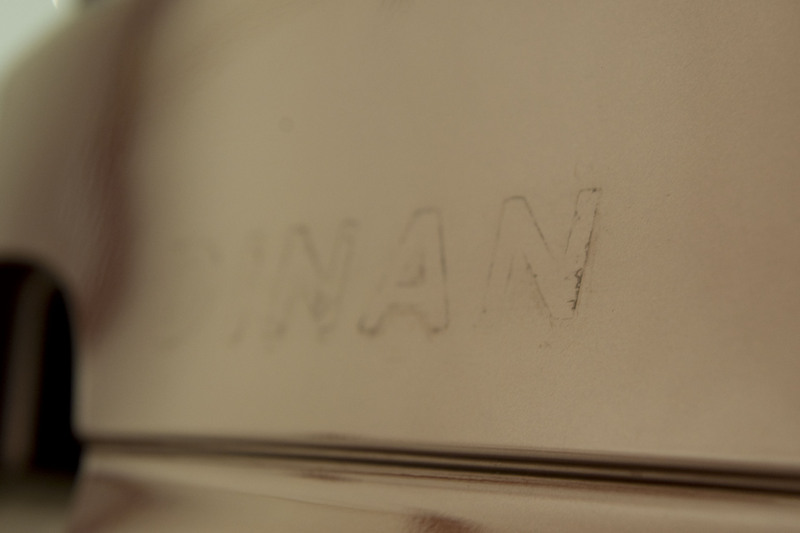 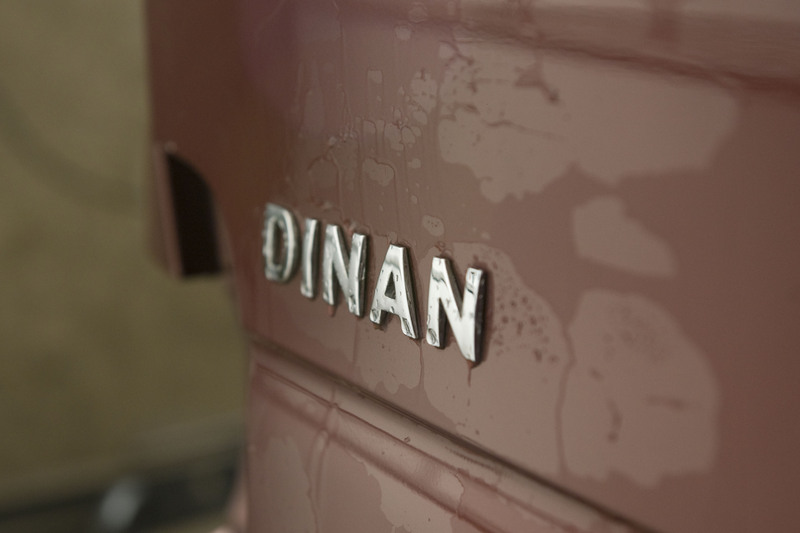 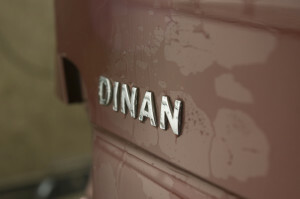 The owner also specified the he would like us to remove the DINAN badge. 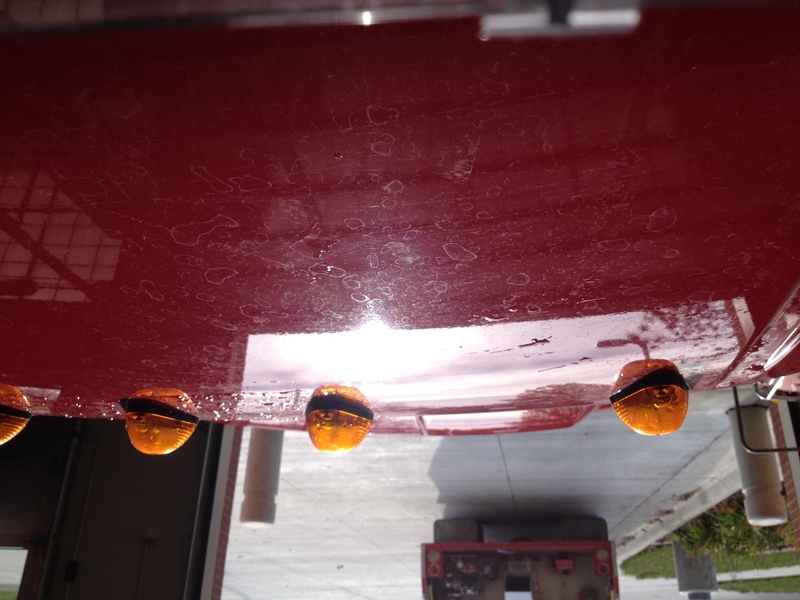 After heating the adhesive loose we were able to peel these off. 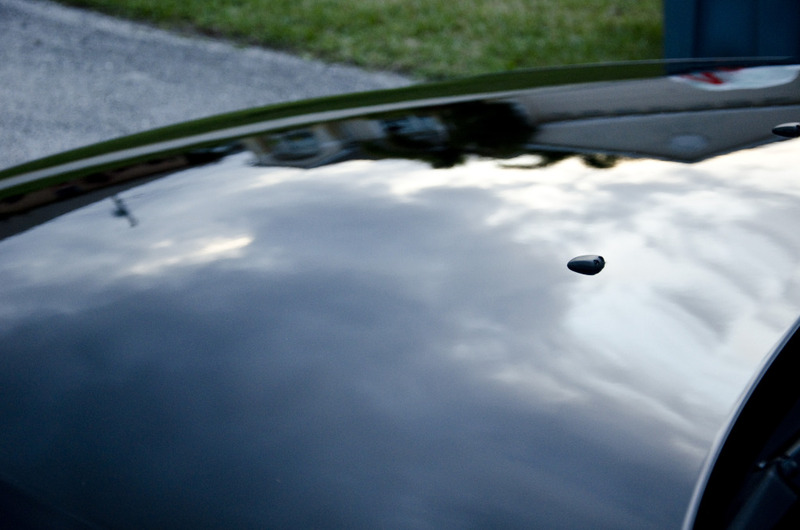 A clay bar and much cleaning took care of the residue adhesive and wax, and the polishing step got rid of the marring that was left behind, leaving a smooth clean surface. 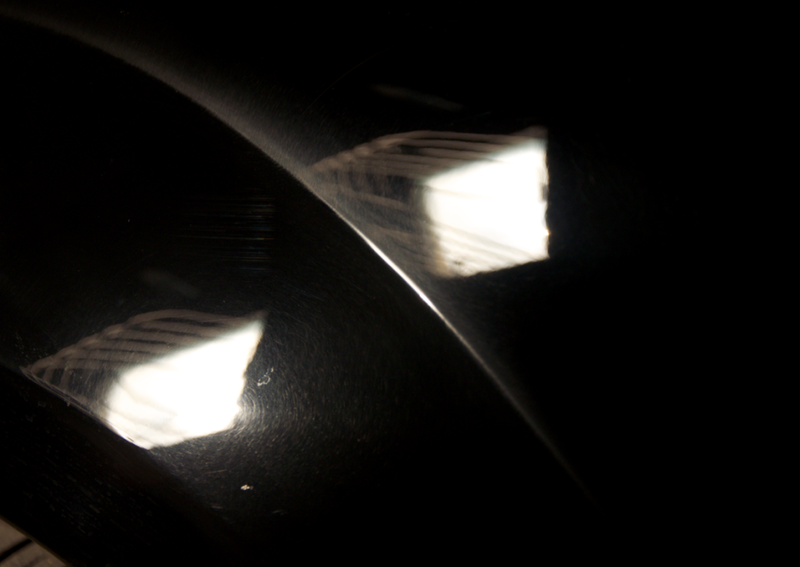 After a late night/early morning on the first day, copious amount of a special grind were produced to aid in the clarity of the process.. 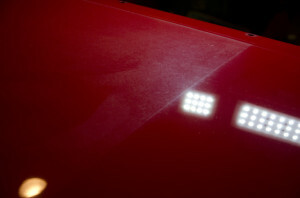 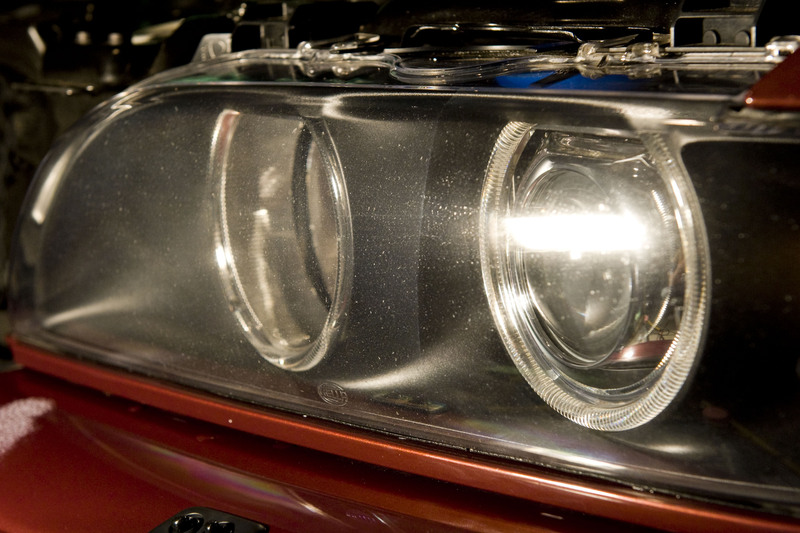 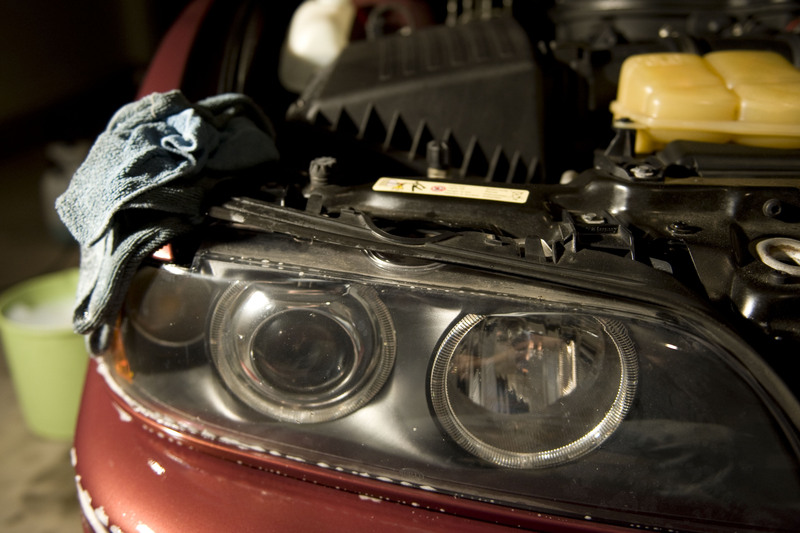 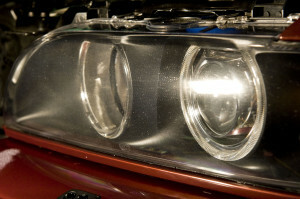 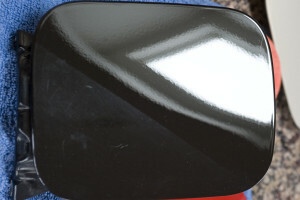 The headlights were polished – to further correct them would require a sanding step. The car was lifted up to gain better access to the diffuser and bumpers. 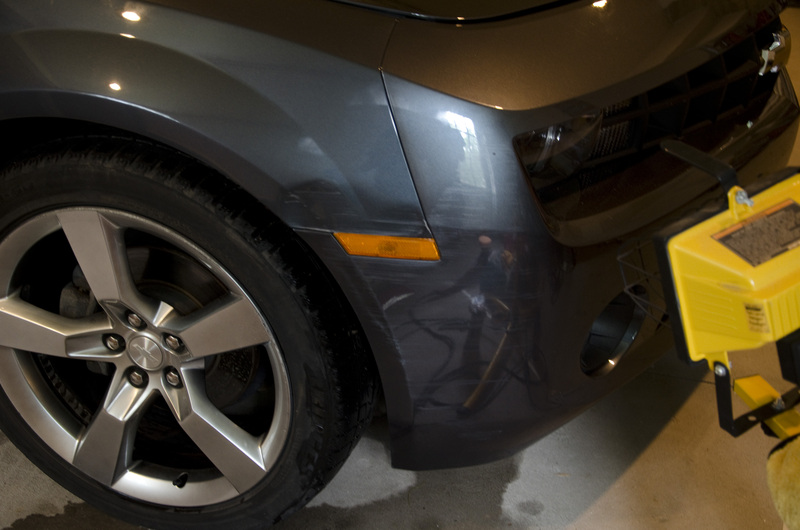 Wheels were removed, cleaned, and topped with a sealant. 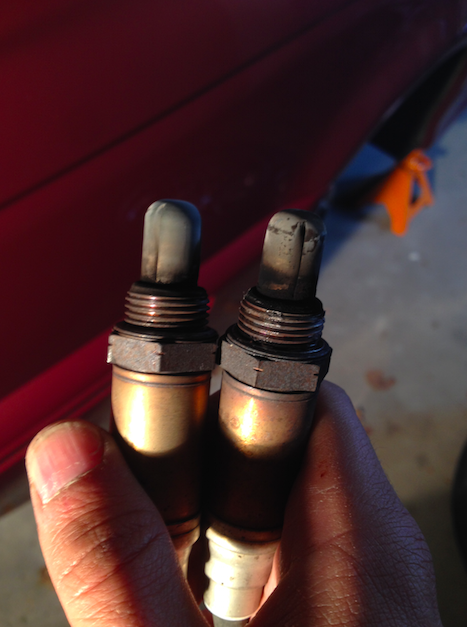 Pre-Cat O2 sensors were replaced as well. 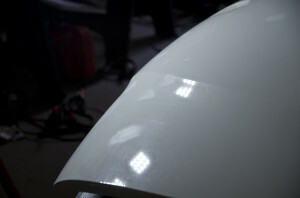 The car got its final wipedown and inspection, then it was topped with a layer of Opti-Coat to protect our hard work. 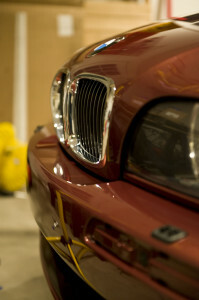 Following an overnight cure, we reinstalled all that we had removed and went out on the town to get some beauty shots. 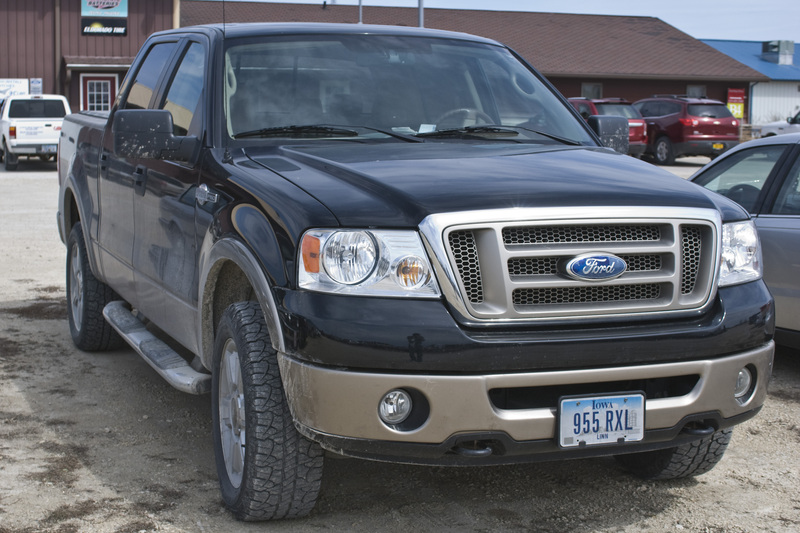 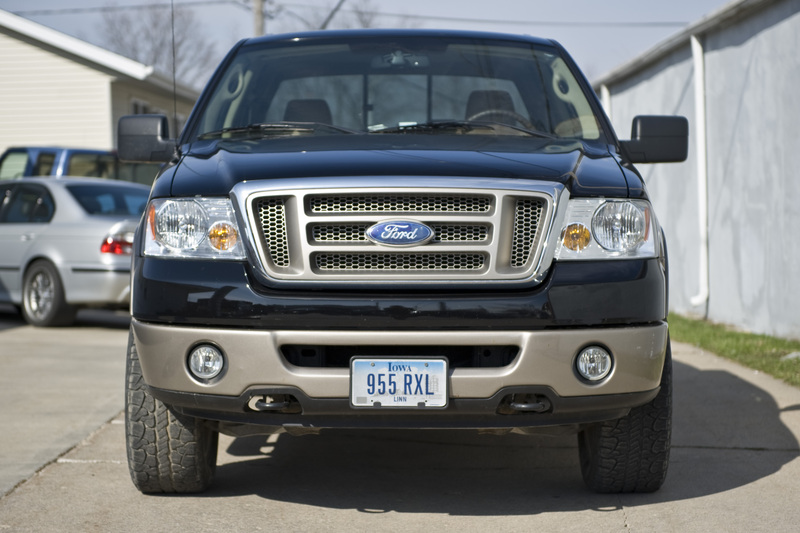 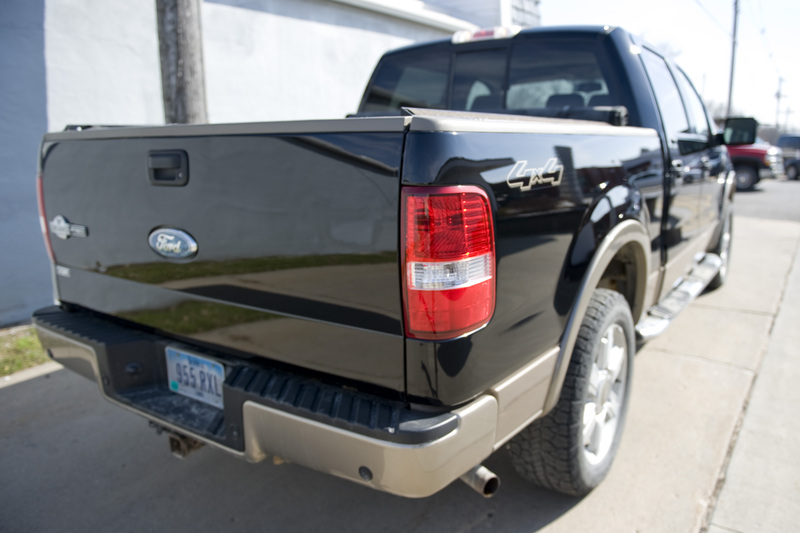 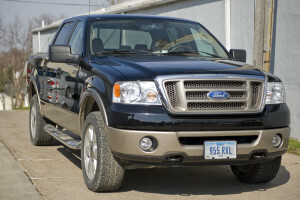 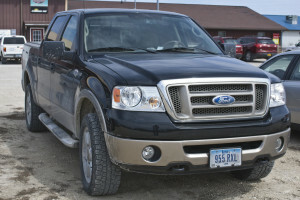 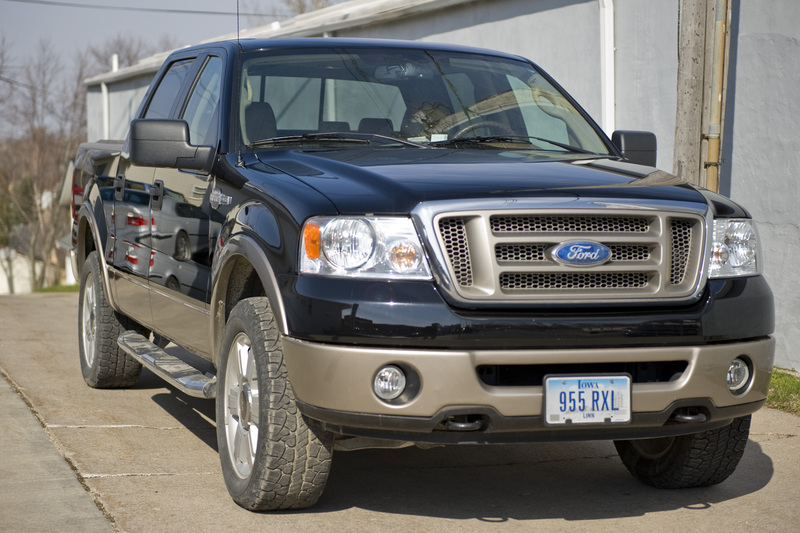 This Ford F-150 came to us with a large amount of exterior swirls and scratches in its black and tan paint scheme, following many miles on Iowa’s gravel roads. 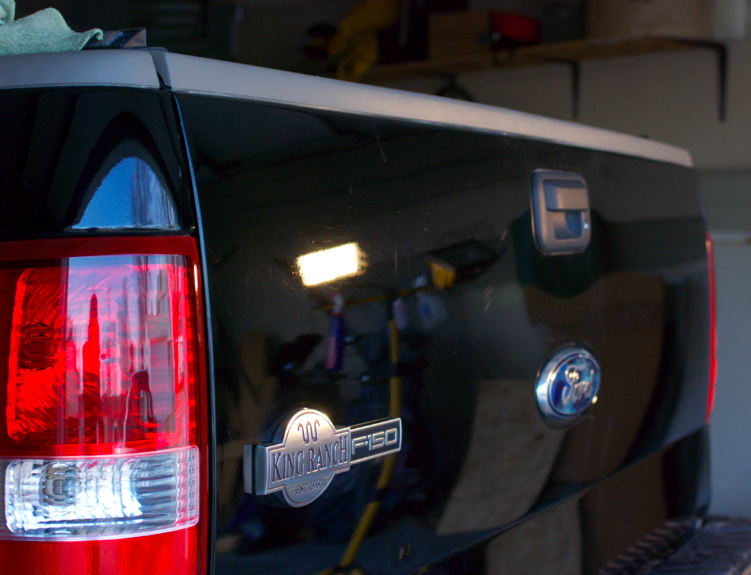 After realizing the potential of this paint after a sample area detail, the owner opted for a single stage correction, protected with an application of a ceramic topcoat (opti-coat). 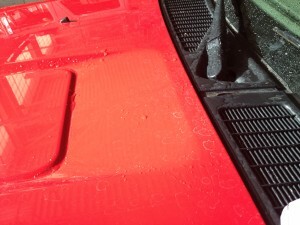 We started with a thorough cleaning to better assess the paint condition. We found many light swirls and actually very few deeper scratches. Two of the doors had been repainted at one point and there was some orange peel and sanding marks left from that process. 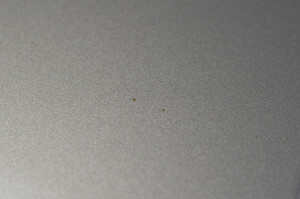 In addition to the scratches, there was quite a bit of embedded contaminants needing to be removed with a clay bar. 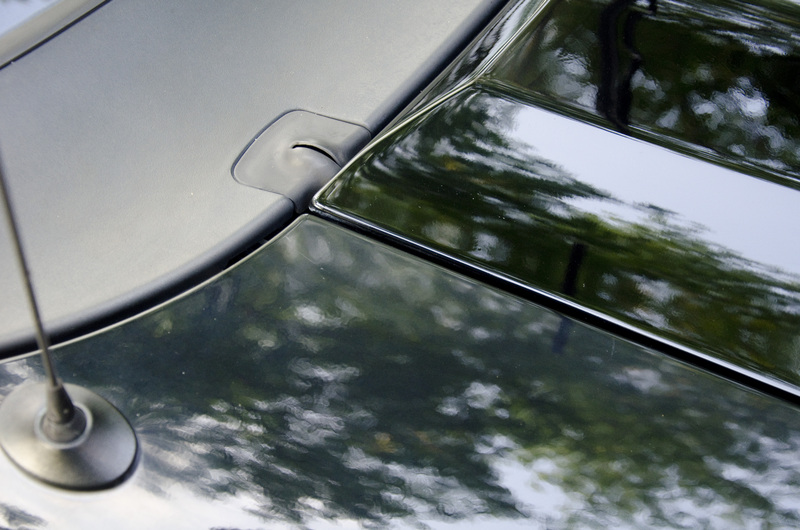 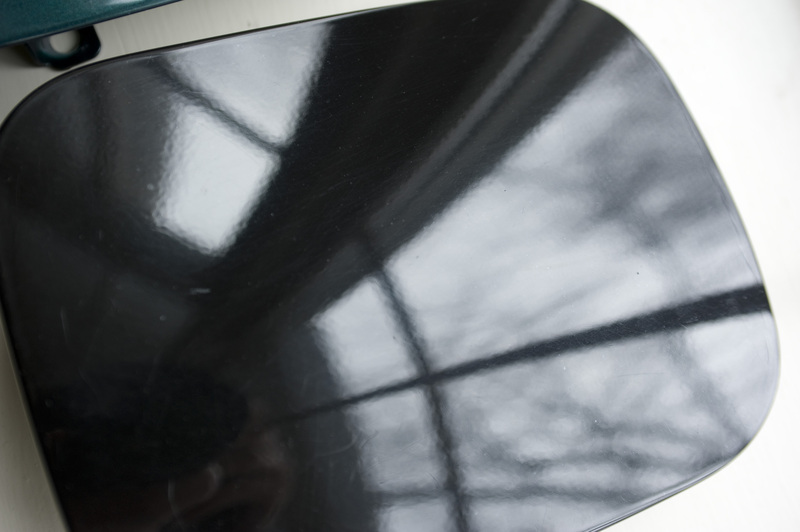 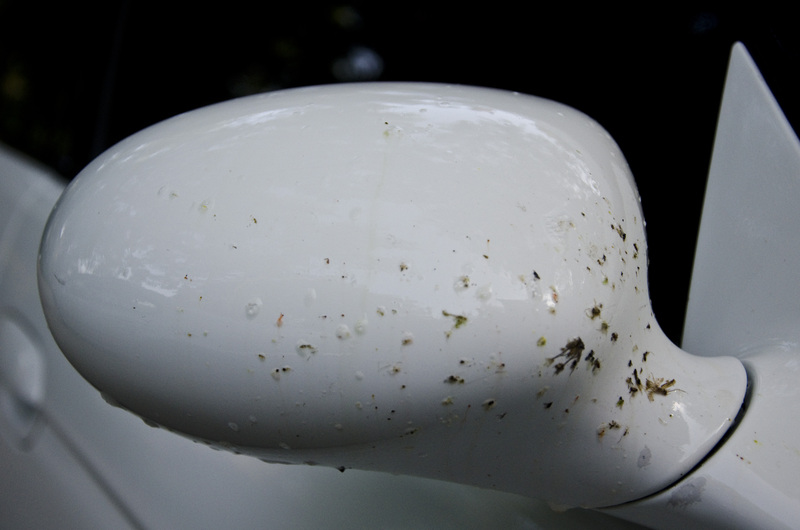 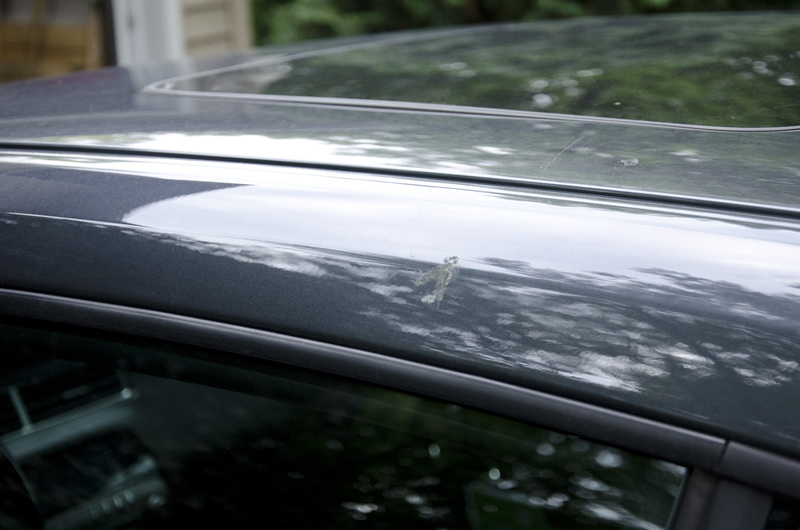 A few small round spots on the hood and roof had signs of early clear coat failure – likely due to bird droppings. Even the 4×4 decal is seeing improvement. 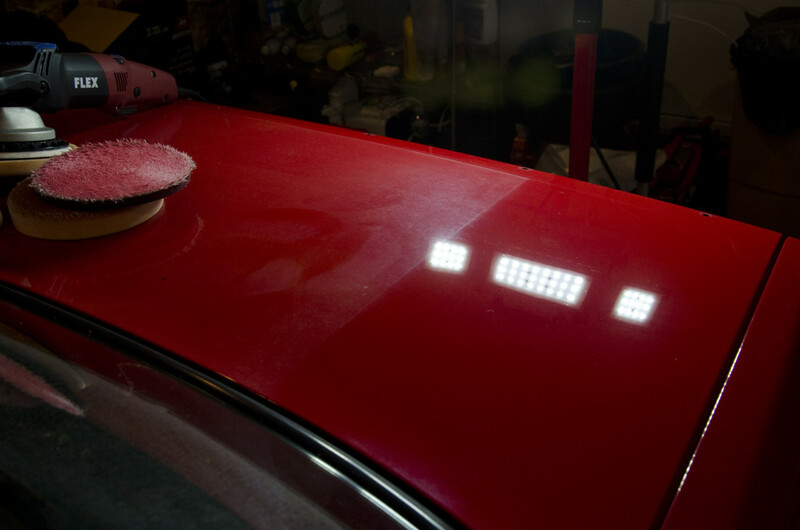 After going around the edges and tight spots with a 3″ polisher, it was time to wipe the car down again and prep for opti-coat. Here it is – outside under the scrutiny of the sun – swirl free with a topping of permanent protection to keep the paint swirl free longer. 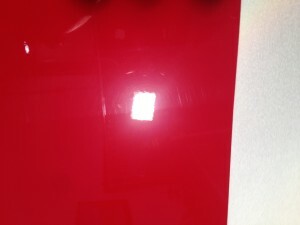 Contact us to see what you could expect on your vehicle with our paint correction service. 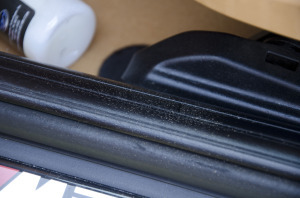 Your car does not fit a package or special.. 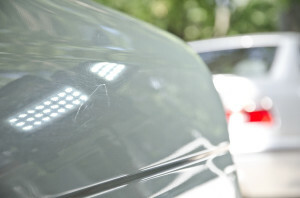 Otherwise you would just run your car through the automatic car wash. We are not in the business of quick wash and wax jobs, we are in the craft of paint correction. 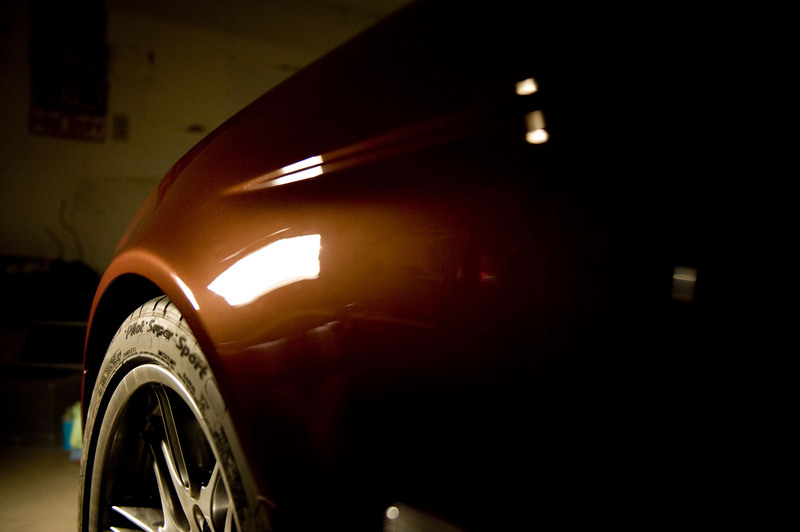 We will safely polish your vehicle’s clear coat, and protect it with Opti Coat Pro, so you don’t have to come back all the time. 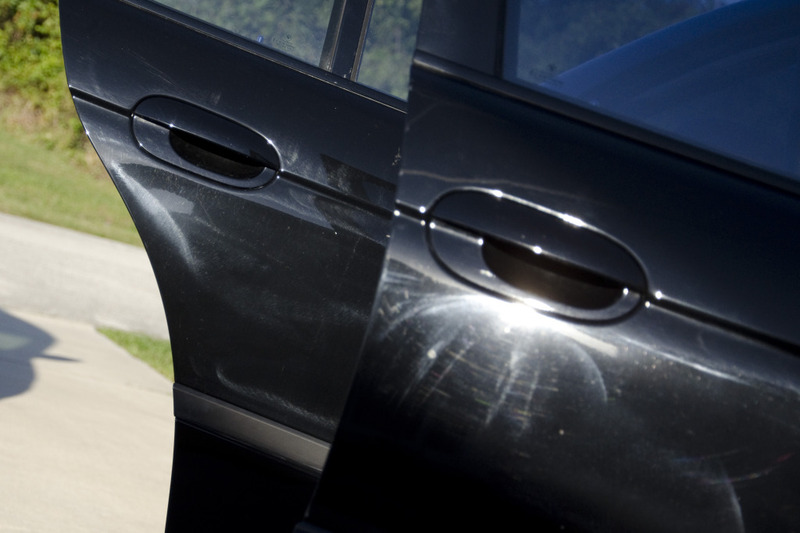 We start with a thorough cleaning of the exterior, we usually spend a lot of time getting rid of wax stains, railroad dust, brake pad residue, tar, and dried insect guts. 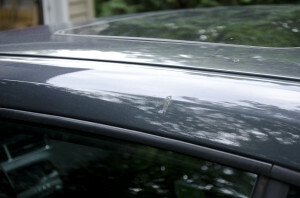 Ever notice how you seem to have swirls that come up a few weeks after you get your car “detailed”? 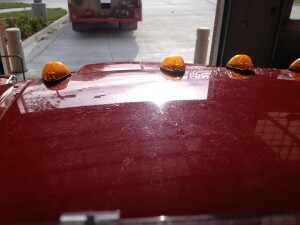 They simply masked the problem with wax containing fillers. 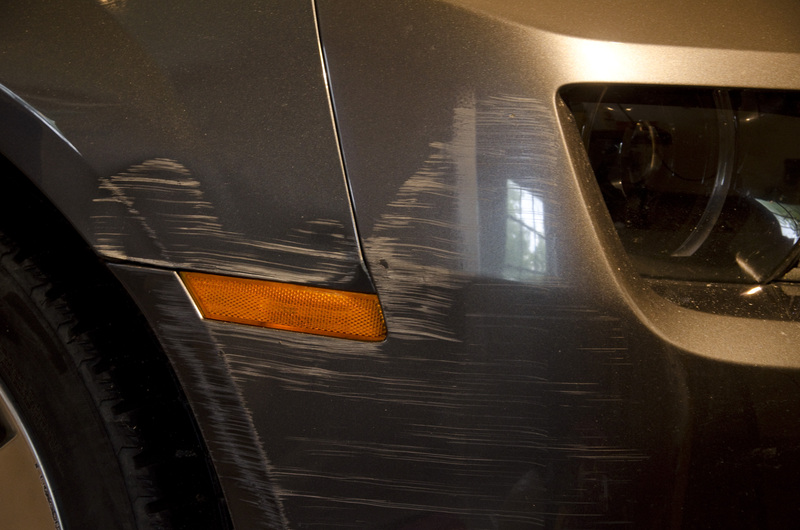 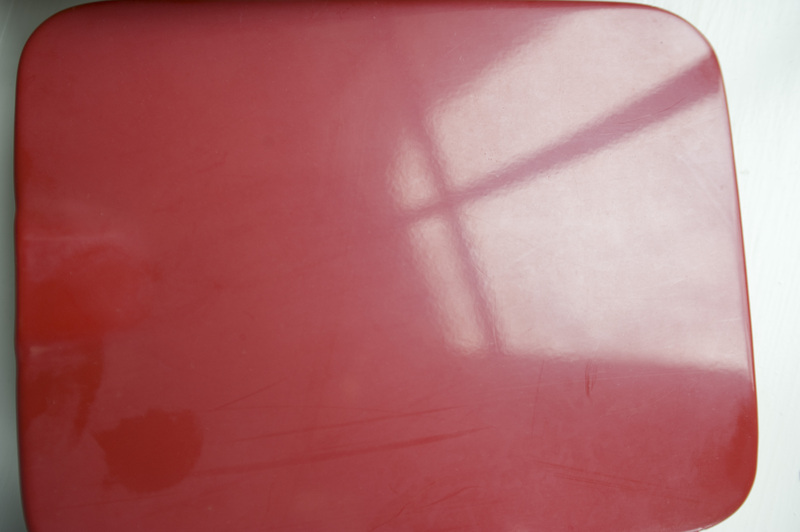 Removing all wax and filler residue, the true condition of your paint can be assessed and documented. 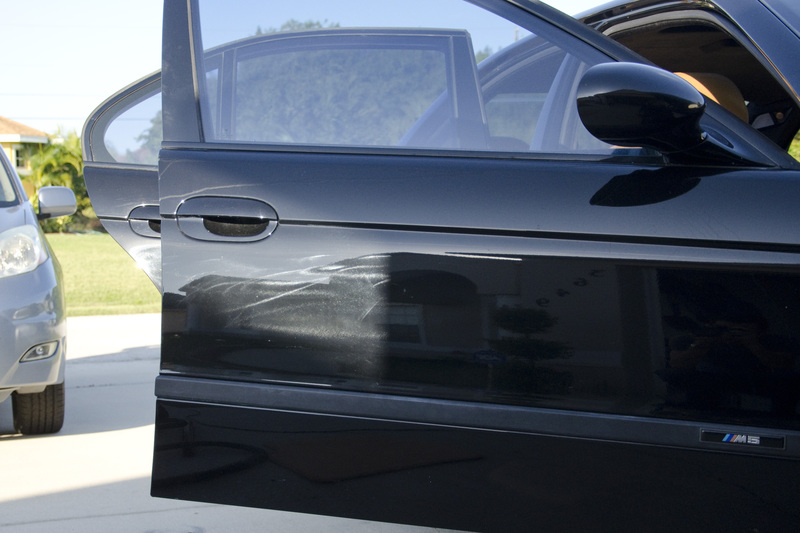 We will choose a course of action that produces the best results, while leaving as much of your car’s original clear coat intact. 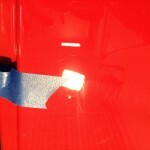 Removing protection to add protection does not make sense to us either..
We will perform a single stage paint correction to get rid of gloss robbing swirls. 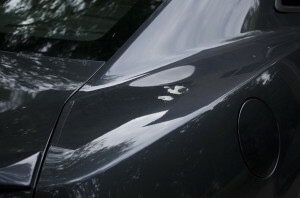 Don’t think you have swirls? 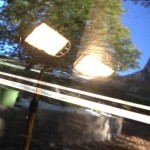 Under a 1000 watts of lighting you do. If you really do not have any, well you just saved some money on prep. 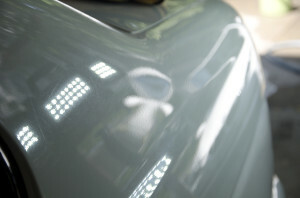 Click on these pictures to see what a single stage paint correction will do for you. For more dramatic examples, check out these 50/50 panels we did for marketing. 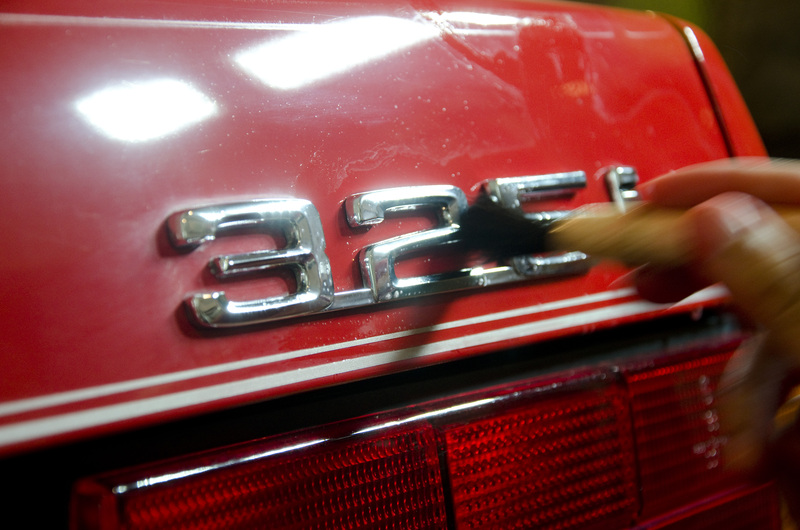 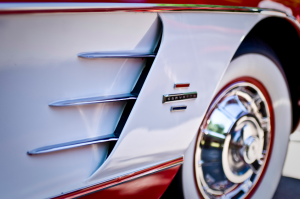 After putting all that time into restoring your paint, we need to protect it. 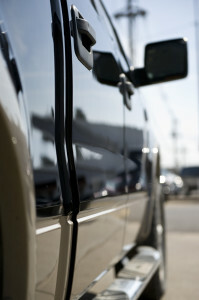 We top our freshly polished vehicles with a hard wearing, filth repelling, shiny new ceramic clear coat. Unlike waxes, this will not wash off and it actually adds 2 microns of thickness on top of your vehicle’s original clear coat, leaving a valuable buffer between the paint and the elements. 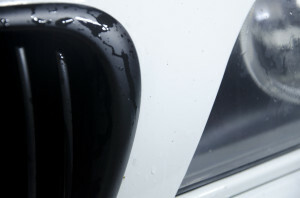 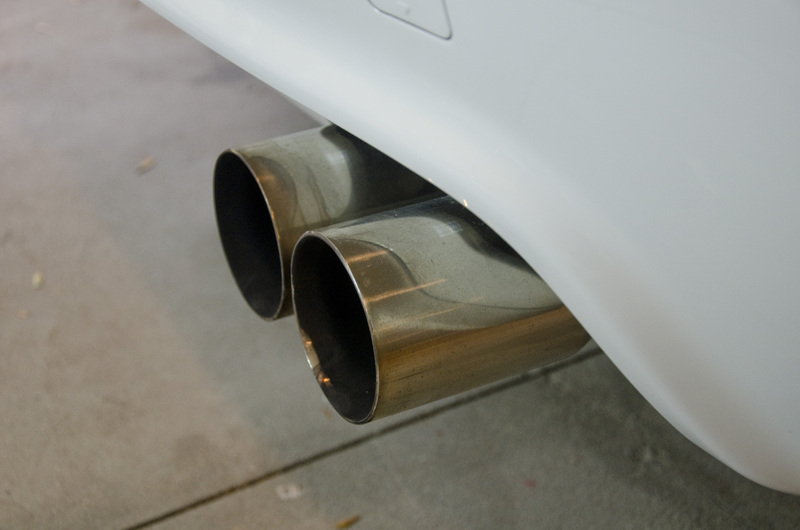 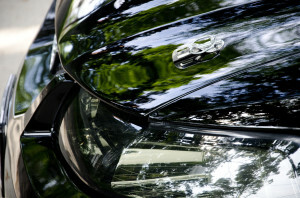 Although your new coating adds some depth and gloss, its main purpose is in providing protection. We can add more shine with a fully synthetic polymer sealant, for a deep gloss and slickness that makes it look like your car is encased in glass. 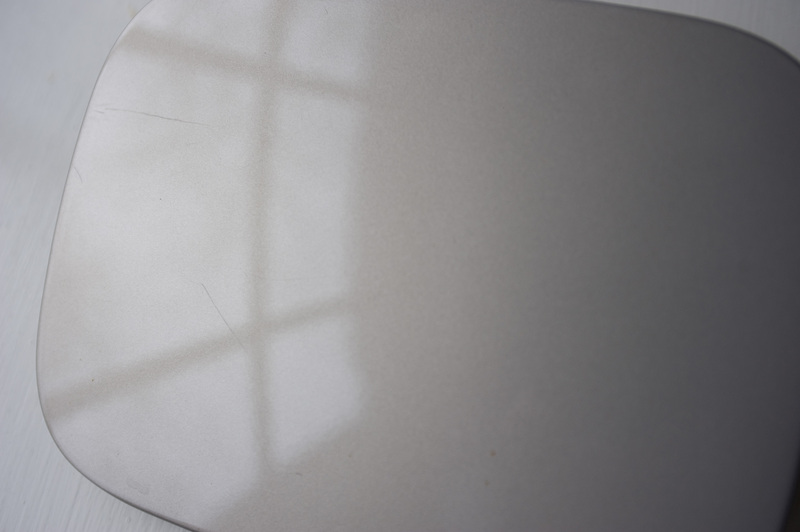 This product is wipe on walk away, meaning no excessive wipe on wipe off routines that increase the potential for scratching. 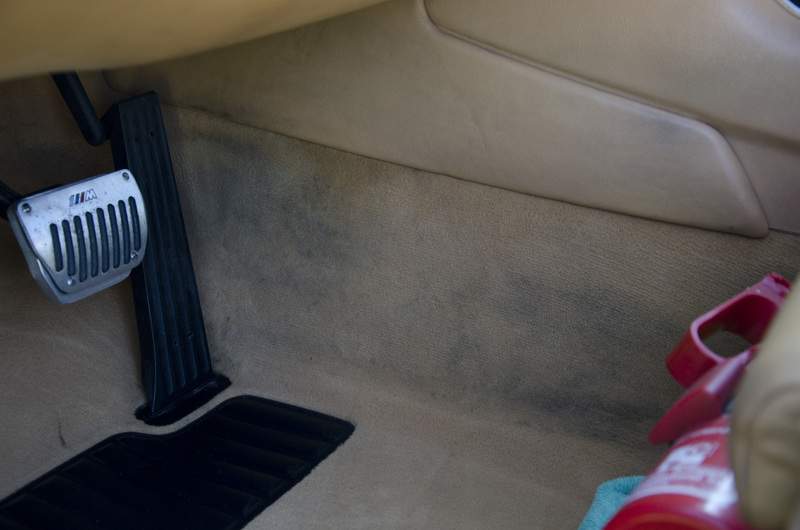 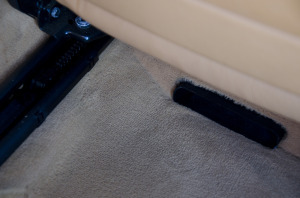 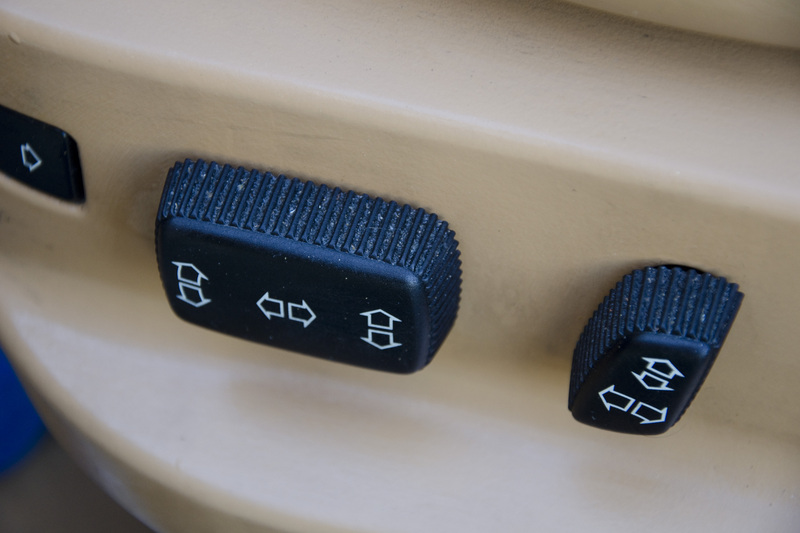 In addition, it dries clear, keeping your freshly cleaned trim devoid of white wax residue. You will find your slick new ride keeping cleaner longer, thanks to the new repellent coating. 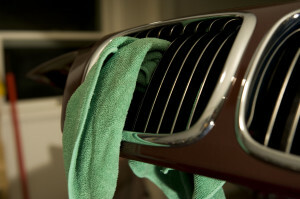 But there will be a time when you will need to wash it. 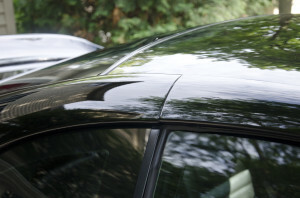 As you take delivery, we will recommend some best practices to keep your car from getting swirled up again, using fast, safe, and low water solutions. 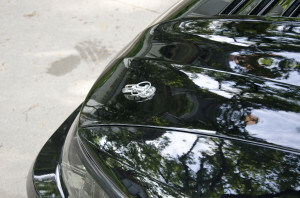 Though we would be happy to wash it for you and top with some sealant to show off a bit. Good washing habits are key to keeping your car swirl free for the long run.